Maroon Bells and Maroon Lake. Mid-morning. September 24, 2015. Welcome to my Colorado fall color travel and photography guide with over 100 pages of information (if you print it all out), 120 photos, and 17 maps. 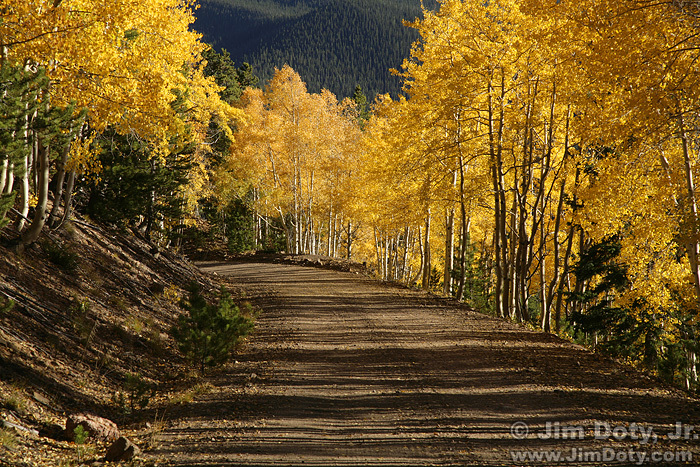 I cover some of the best known fall color locations in Colorado, and one real gem of a road that is mostly unknown to photographers and leaf peepers. 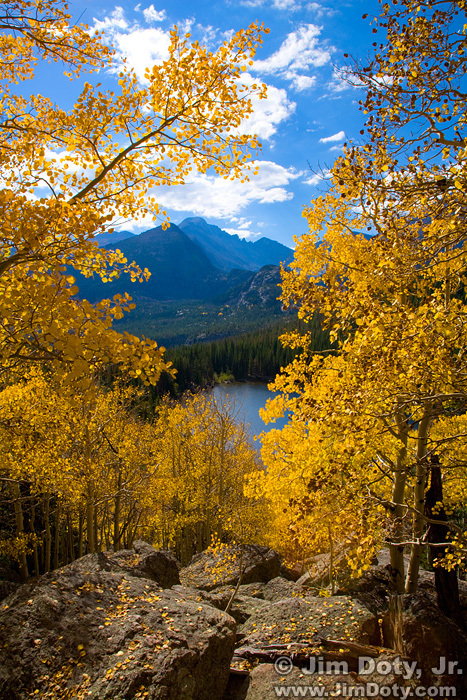 Spend anywhere from a few days to three weeks exploring the beautiful Colorado Rockies at a gorgeous time of year. Updated and re-posted July 22, 2018. The idea for this article started with a 25 minute phone conversation with some good friends who were flying to Denver in the fall and asked me to suggest a week long travel route with places to see, stay, and eat. That conversation became the basis for this article which has now been revised and updated several times. The basic trip outlined below will take a week (which matches their travel plans), but I added enough optional side trips to fill up a two to three week trip (and provide multiple options in case a surprise fall blizzard makes some locations difficult to get to). If you are limited to a couple of days or a long weekend, pick one or two of the locations and have fun exploring. Mt. Sneffels and the Sneffels Range from County Road 7 (East Dallas Creek), Colorado. October 3, 2014. I give recommended trip summaries based on the amount of time you have. That is followed by detailed information on all of the options. Not all of these photo locations have aspen, as you can see from the photos, but they are places too special to easily pass up as long as you are in the neighborhood. The good news about the non-aspen locations is you don’t need to worry about being too late or too early. Just show up and pray for great light. WordPress scrunches large maps, so you will need to click on the maps below to get a larger, more readable version. One week fall color trip in Colorado (blue route). Two weeks or more with optional side trips (green routes). Click to see a larger version. The aspen in a given area turn around the same time every year, give or take a few days, and each area turns at a different time. But the extent of the color each year and the time the color lasts can vary widely. The wrong kind of weather can strip the leaves before they reach their prime color, or turn the aspen from green to dull brown without them ever turning gold. Or just the right kind of weather can keep the leaves golden for a week longer than usual. All of this is to say it is a bit of a gamble from year to year. 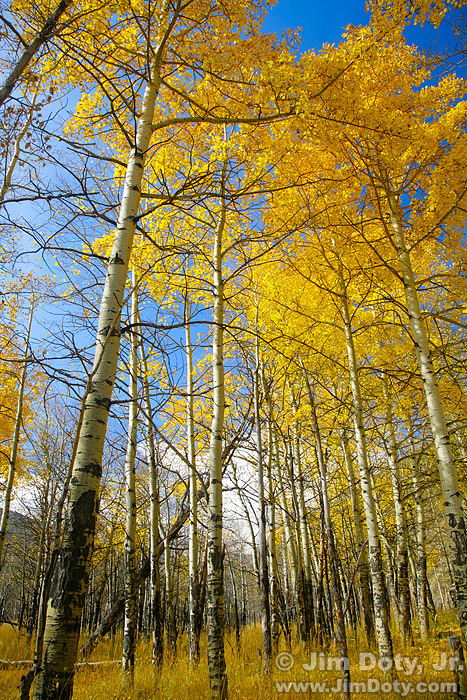 You make your best bet based on when the aspen peaked in prior years and hope for the best. 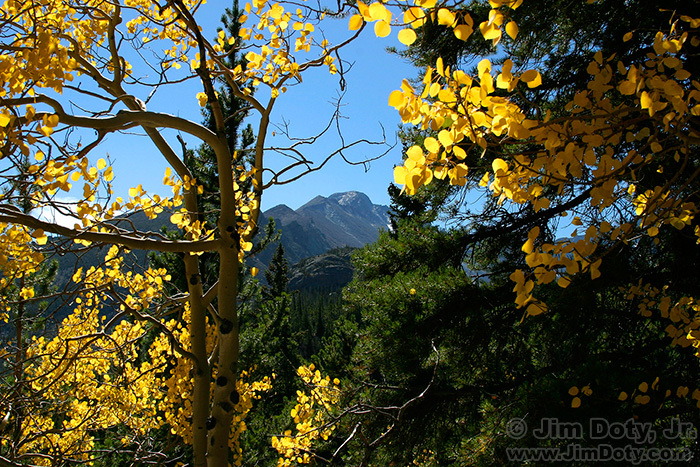 On a fall color trip I prefer to start up north and spend two or three days in Rocky Mountain National Park (which is many locals call “Rocky” or “The Park” for short), and then head to southern Colorado and/or the San Juan mountains in the southwest corner of the state. Aspen, Bear Lake Road. Rocky Mountain National Park, Colorado. September 29, 2014. The aspen generally turn in Rocky the last two weeks in September but the color can occasionally linger into the first week of October. The leaves usually turn sooner at higher elevations like Bear Lake than at lower elevations like Moraine Park and Horseshoe Park, but one year thanks to odd conditions the reverse was true. If I had to pick just one week for Rocky it would be the last week in September. 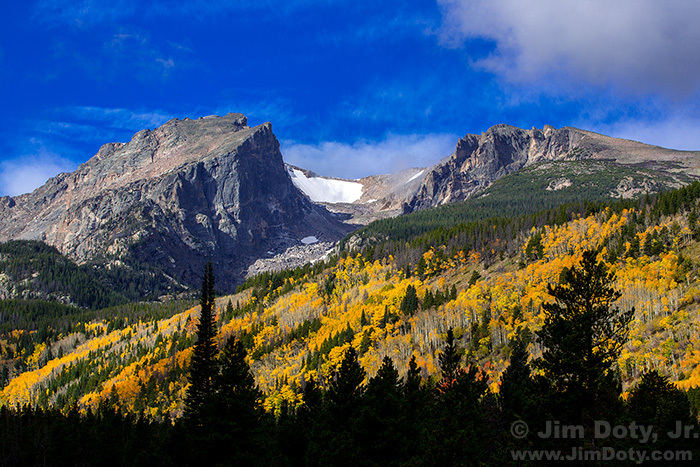 Most years I do a photography workshop or photo safari in Rocky Mountain National Park or elsewhere in Colorado. They are always scheduled for the peak of fall color. 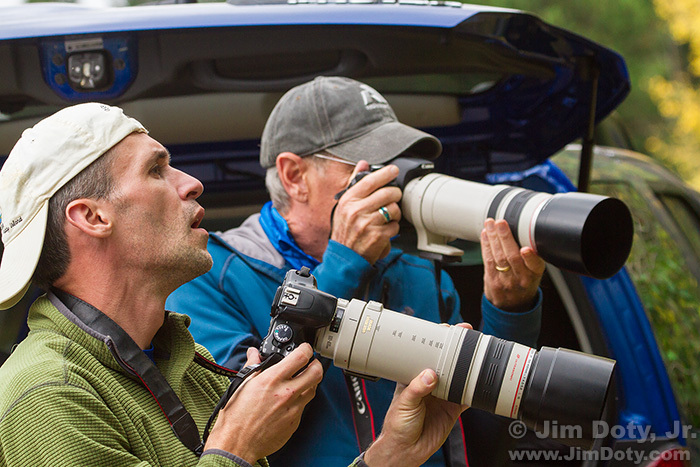 If you are in Colorado in September and want to put your photography into overdrive, check out my total immersion photography workshops and photo safaris. Even if the aspen are done in Rocky when I arrive in Colorado, I usually go to Rocky anyway for at least a couple of days for the mountain splendor and the wildlife. 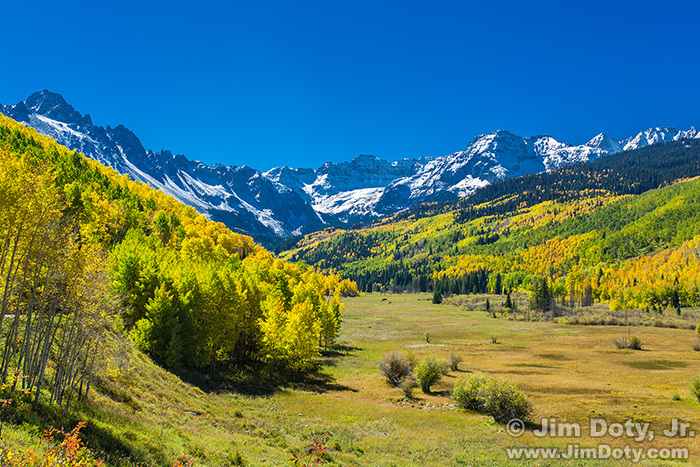 In the San Juan mountains of southwest Colorado, I prefer the tail end of September and the first week in October. Again there are variations. The color can start the last week in September and last through October 10. In south central Colorado around Marshall Pass, O’Haver Lake, and Westcliffe, I split the difference and aim for the last few days of September and the first few days of October. The good news is there is almost always great color somewhere from September 20 to October 5 unless it is a really unusual year. If the color isn’t great at one location, head on to another location. I give you a lot of options. 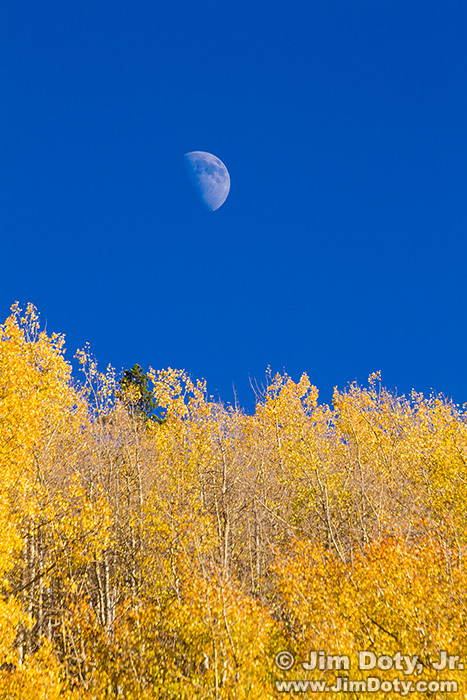 Moon over Aspen. Marshal Pass Road, Colorado. October 2, 2014. As an aid in picking the best fall color dates, you can look at the dates under the photos in this guide. They will give you a clue as to how far the color change progressed for a specific location on a given date. In some cases you can compare the same location and different years. Scenes without aspen and other deciduous trees look the same year around (except for the yellowing of the grass and the presence of snow) so the dates you are there aren’t so color important. This article is about where to go and when, not how to take great pictures when you get there. To learn the “how-to” part of photography there are dozens of articles at this site and at JimDoty.com, and I recommend some great “how to” photography books in the links section below. But here are a few basic tips to get you started. Morning Light, Pond near Sprague Lake, Rocky Mountain National Park. September 30, 2014. Great landscape photography is dependent on great light for the particular landscape you have in mind. If you want incredible sunlight on morning clouds, the sun needs to show up. If it is cloudy and gray your wonderful morning sunlight isn’t going to happen. Aspen can look great on a cloudy day if you leave the sky completely out of your photos. A big, flat gray sky at the top of a photo can kill an otherwise good landscape image. 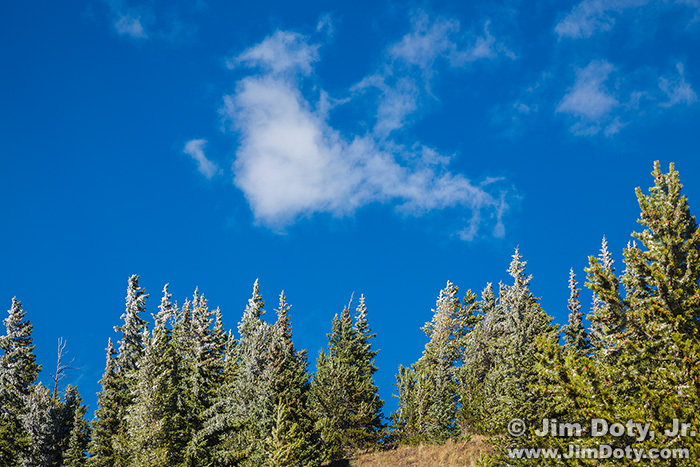 Cloudy days are great for small intimate landscapes (like a small grove of trees, a single tree, or just a few leaves). 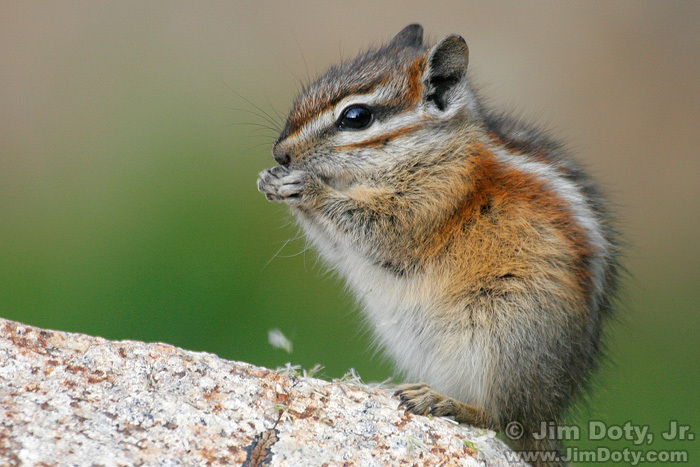 Least Chipmunk eating grass seeds near Long Lake, Indian Peaks Wilderness, Colorado. July 30, 2007. Cloudy days are also good for wildlife and the few remaining flowers that are still around in protected lower elevations. Hallet Peak, Tyndale Glacier, and Flattop Mountain from the Road to Bear Lake. Rocky Mountain National Park, Colorado. September 29, 2014. When the sun is out, the golden hours before and after sunrise and sunset have the best light of the day. Backlit and sidelit photos are more dramatic than photos where the sun is behind you. Sidelit Aspen, Marshall Pass, Colorado. September 28, 2010. Backlit or sidelit aspen leaves with the sunlight shining through them look especially nice against a dark background of evergreen trees. 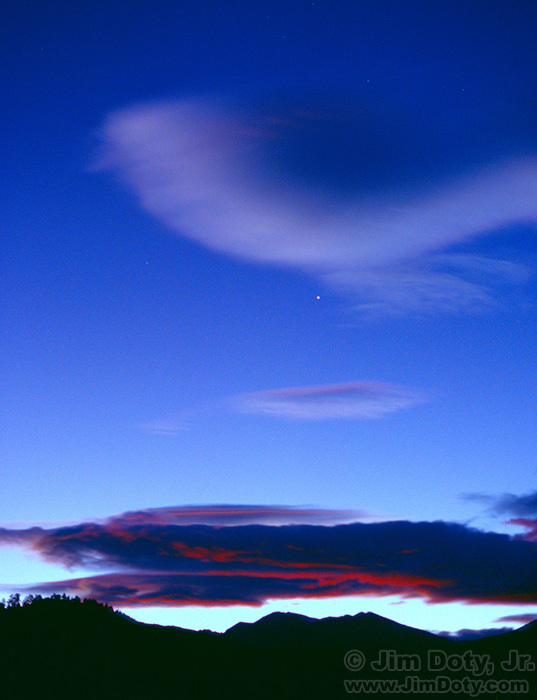 Dove Cloud and Venus. Rocky Mountain National Park, Colorado. October 8, 1989. And you can get some really fine landscape photos at twilight and at night. Photographers, Horseshoe Park, Rocky Mountain National Park, Colorado. September 28, 2014. Don’t forget to use long focal length lenses for some of your landscape photos. Long focal length (telephoto) lenses are the secret weapon of experienced landscape photographers. You can extract small portions out of a larger landscape with a telephoto lens. Some of the best landscape images are taken with long focal length lenses. 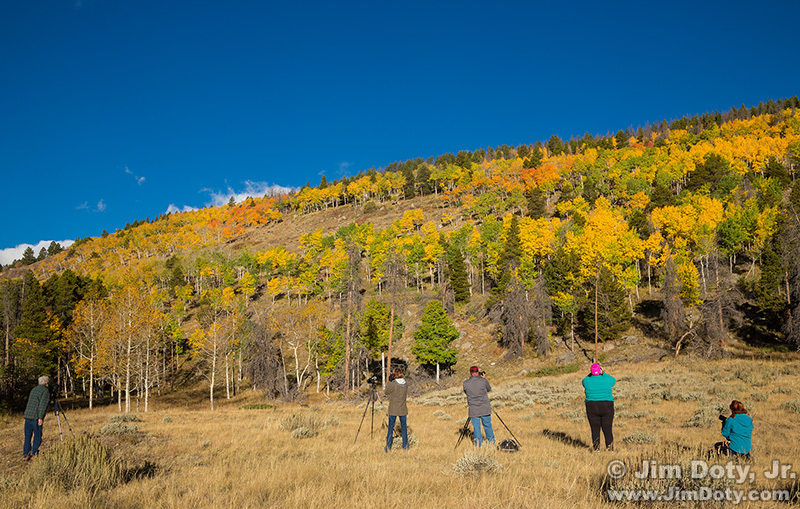 The two photographers in this photograph are getting ready to use their telephoto zoom lenses to photograph aspen trees on a hillside. While inexperienced photographers think of telephotos lenses primarily as wildlife or sports lenses, telephoto lenses are just as useful for landscape photography. Eight of the landscape photos in this article were taken with focal lengths from 200-400mm and another ten landscape photos were taken with focal lengths from 100-180mm. You don’t have to go out and buy a fancy DSLR and expensive telephoto lens to get long focal lengths. More and more point and shoot cameras (including some that cost around $200 – $400) are offering zoom lenses with long focal lengths. 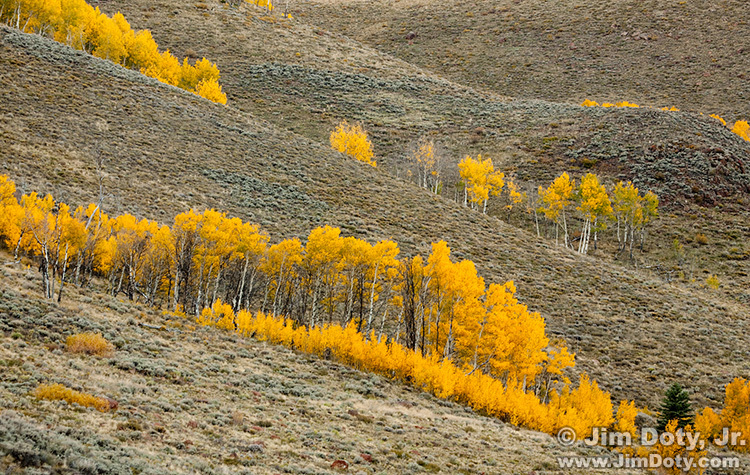 If you use exposure compensation on your camera to get better exposures, remember to use minus exposure compensation for scenes dominated by evergreens and plus exposure compensation for scenes filled with golden aspen leaves. 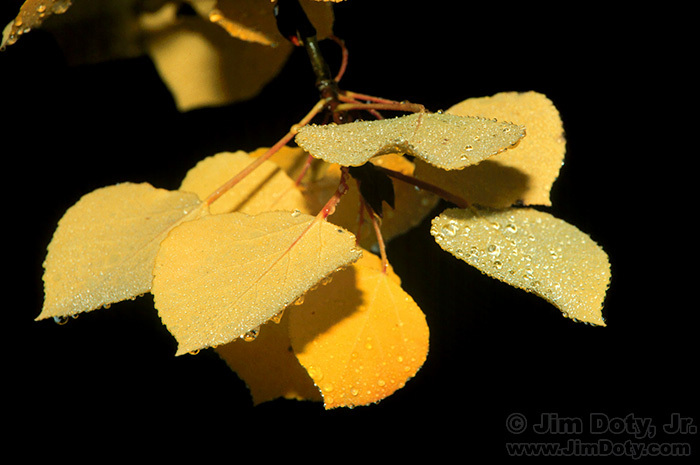 You can learn about exposure compensation is this article. These are my suggestions based on the amount of time you have and when you arrive in Colorado. Fill in the details with the extensive itinerary options in the rest of this article. 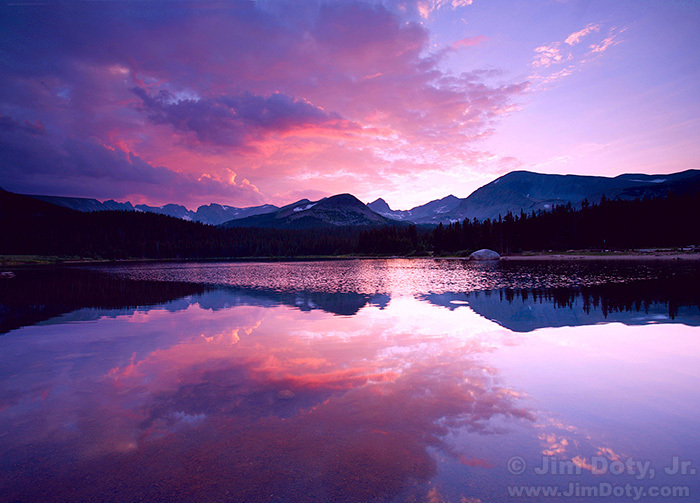 Option 1: Rocky Mountain National Park. You just can’t beat Rocky for scenic variety and wildlife possibilities all in one place. If you only have 2 or 3 days, this is the place to go. 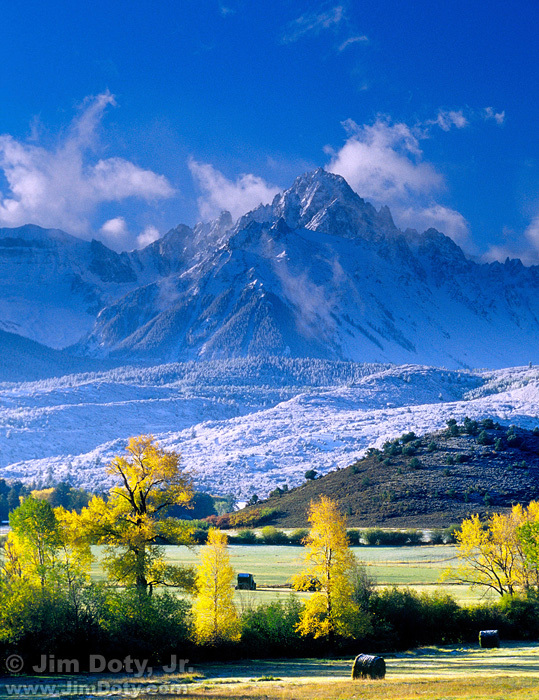 Follow the detailed itinerary options below to see aspen and wildlife. Rocky makes up almost half of this guide). Option 2: If you are in Colorado late in the fall color season (see the fall color section above), and you are starting out in Southwest or Southern Colorado, choose from the Southwest and Southern Colorado options from the itinerary below. If you are starting from Denver, go to Rocky and enjoy the mountains, evergreens, lakes, streams and wildlife, even if the aspen are mostly done. It would take too much time to drive to the other locations. 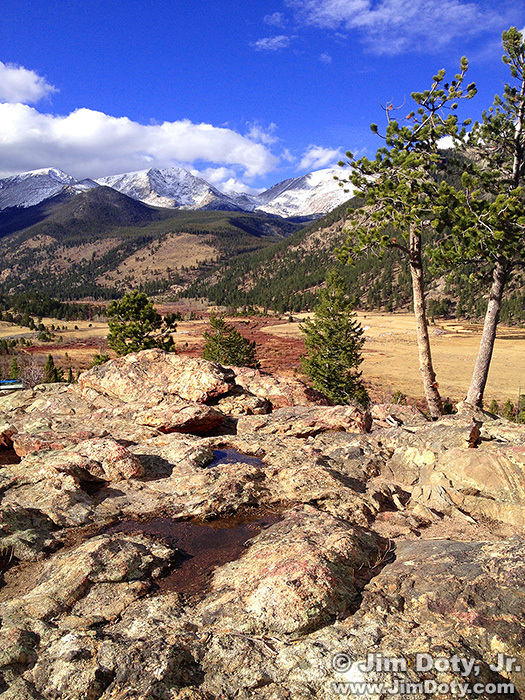 Option 1: Spend all your time in Rocky Mountain National Park. Option 2: Spend most of your time in Rocky but take the Peak to Peak Scenic Byway with a short side trip to Brainard Lake on your way from Denver to Rocky on on your way back to Denver when you leave Rocky. Option 3. If you have five or six days spend two or maybe three days on an Aspen/Maroon Bells trip and the rest of your time in Rocky. The aspen turn early at the Maroon Bells (peak is usually September 23-25) so try to arrive in Aspen during that three day window. Option 4: If you have five or six days and you are in Colorado late in the fall color season (first week in October) and the aspen are done in the north, Rocky Mountain National Park is still an option with magnificent mountains, evergreen trees, and the elk rut. 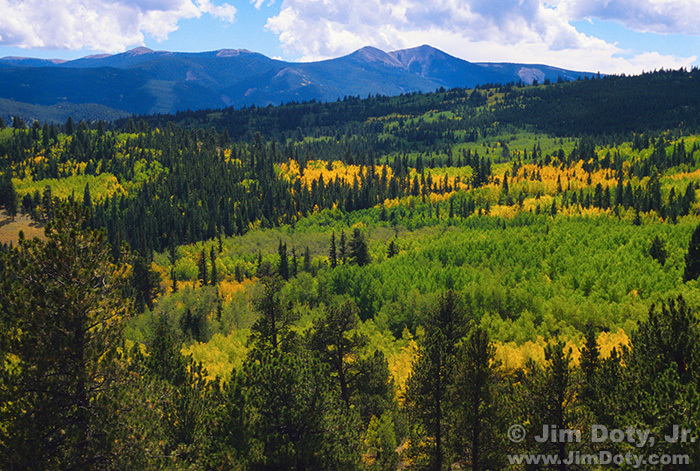 Or you could spend your time in Southwest and Southern Colorado where there will still be plenty of color most years. If you are starting from Denver you will lose 1 to 1 1/2 days driving time getting two and from the beautiful aspen locations. Choose from the itinerary options below. If you are starting from Denver, you only have four days, and you are determined to see beautiful aspen, it can be done but you will only have a couple of days to shoot after you subtract driving time. Head directly to Southwest Colorado after you arrive in Denver. 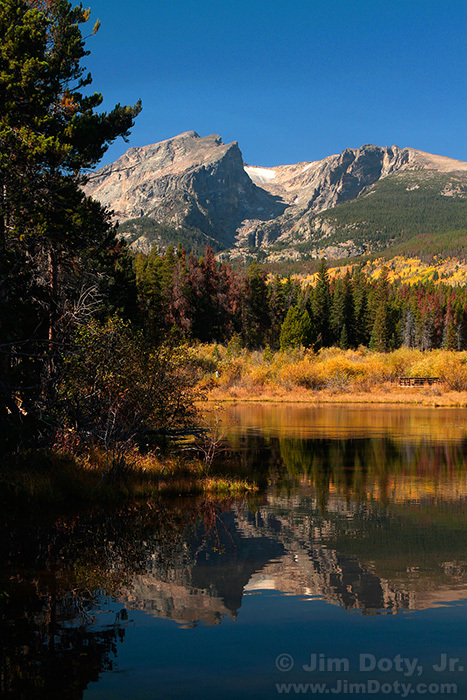 Option 1: Spend three days in Rocky Mountain National Park. Drive the Peak to Peak Scenic Byway (with the side trip to Brainard Lake) on the way to or from Rocky. Spend one or two days on the trip from Estes Park to Montrose (with a side trip over Marshall Pass). Spend three or four days in Southwest Colorado. Option 2: Two days for Aspen/Maroon Bells (if you can be there around September 23-25). Three days for Rocky. One day from Estes Park to Montrose. Three days for Southwest Colorado. This does not make sense in terms of the shortest travel distances, but it DOES makes sense for the timing of the aspen. Start with the options for the 7 to 9 day trip and add more Southwest options (like the Million Dollar Highway, the San Juan Skyway, Mesa Verde, Ohio Pass, and Kebler Pass) and/or Southern Colorado options (like the Great Sand Dunes, the Sangre De Cristo Mountains, and Bishop’s Castle). You won’t have time to add all these options so pick what most interests you from the information below. Start with the Seven to Nine Days options and you can add most of the extra Southwest and Southern Colorado options! If you have the time, the Maroon Bells near Aspen, Colorado is a two to three day add-on to the one week trip. 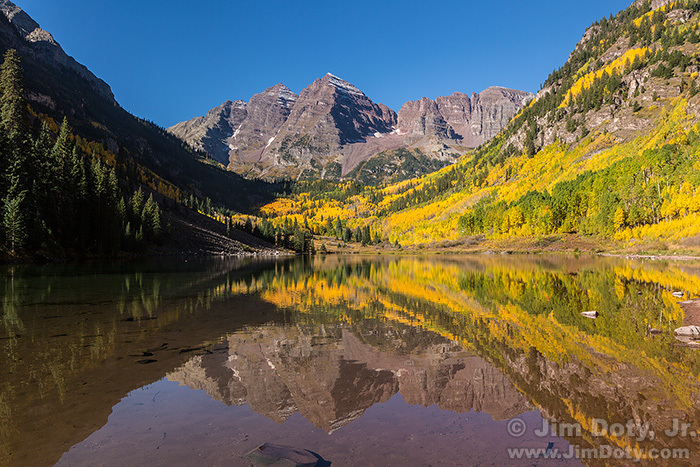 The Maroon Bells are justly famous as one of the most spectacular locations in the state of Colorado. The best time to go most years is around September 23-25, which is earlier than most of the other locations in this guide. If you plan on going to Aspen and the Maroon Bells during your trip you should start here first. You will need a half day to drive there from Denver, either via Glenwood Springs and then southeast to Aspen or via Leadville and west over Independence Pass to Aspen (think 12,000 feet, and narrow, winding roads with some steep drop offs and no guard rails). 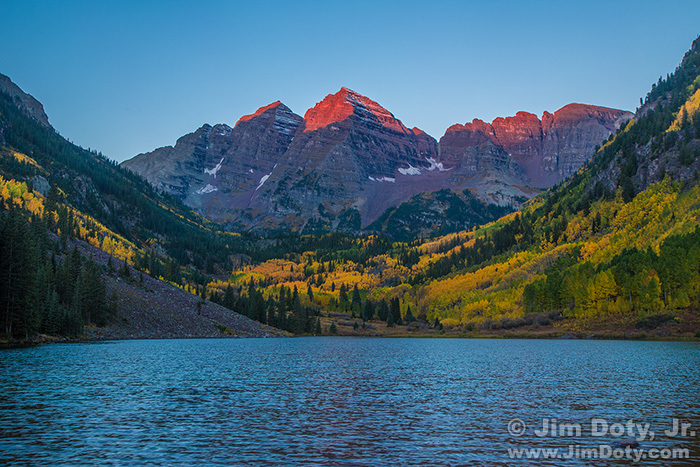 You will want to shoot the Maroon Bells at sunset and again the next day from sunrise through mid-morning before you head on to your next location. 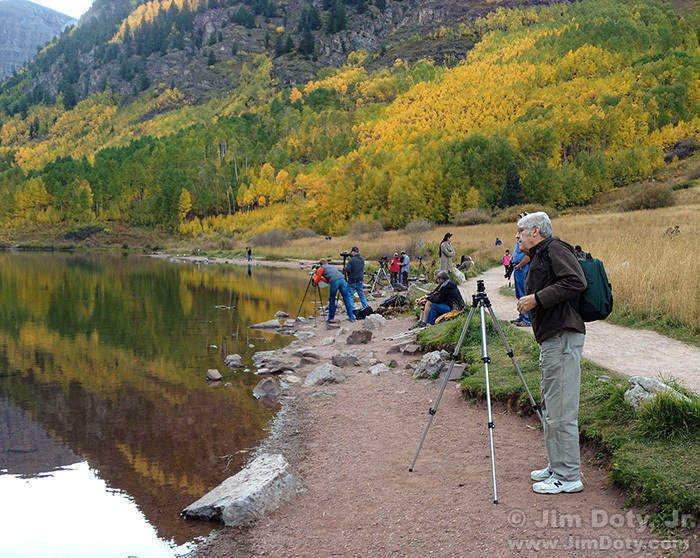 Photographers at Maroon Lake in the evening. September 23, 2015. There will be photographers around in the evening but it should be easy to find a good spot along the lakeshore with a nice view of the peaks. 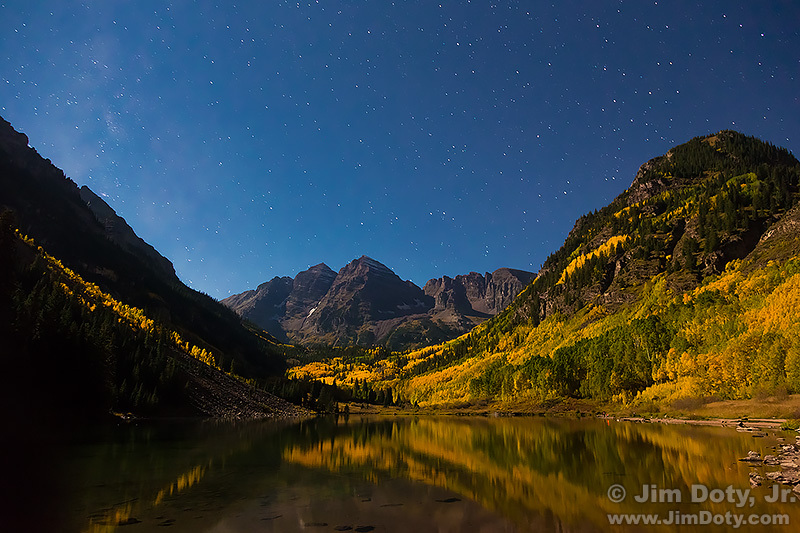 Maroon Bells and Maroon Lake by Moonlight. September 23, 2015. If you are at the Maroon Bells around the full moon, you should stay out late and photograph the Maroon Bells by moonlight. You will just about have the place to yourself with just a few other photographers around. Maroon Bells and Maroon Lake. Early morning. September 24, 2015. In the morning to get a good spot without a lot of other photographers in all of your pictures, you will need to arrive by at least 5:30 am. I counted over 100 photographers the morning I was there and most of the good spots were taken long before 6 am. It will be another three hours before the aspen are fully illuminated by the sun but you still need to stake your claim really early. 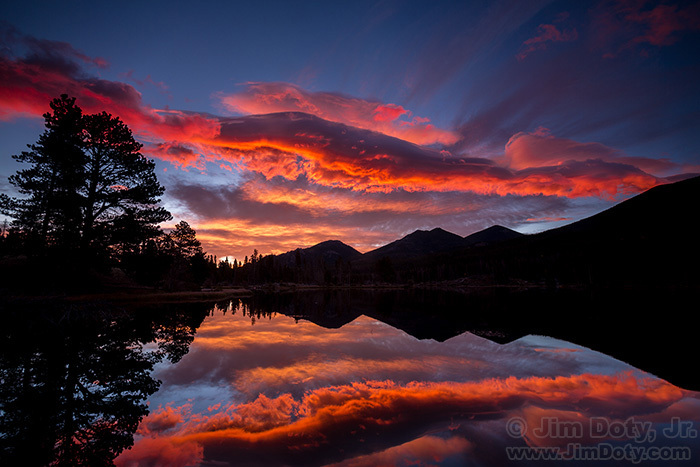 Just in case it happens to be cloudy on the first day you are there, you may want to stay an extra 24 hours to catch another chance at sunset and sunrise, making it a three day trip before you head north to Rocky Mountain National Park or south toward Montrose and southwest Colorado. The fastest route south is to go east from Aspen over Independence Pass and then south on U.S. 24 toward Poncha Springs. Tyrolean Lodge, Aspen Colorado. September 24, 2015. I recommend the Tyrolean Lodge in Aspen which is a small, old style chalet with spacious rooms. 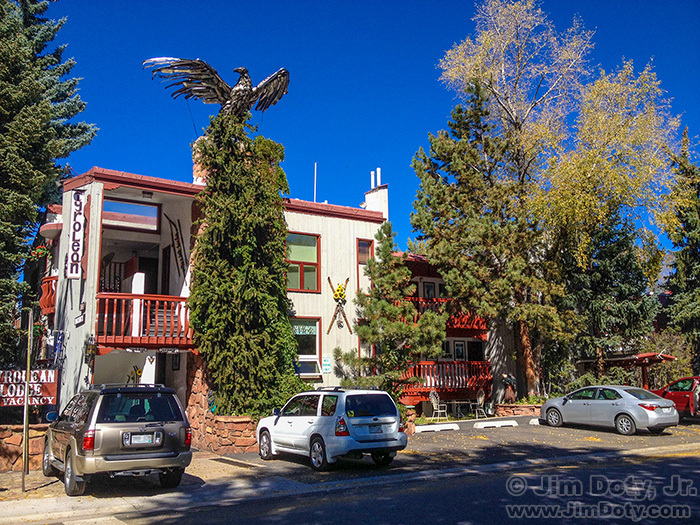 It is an economical place to stay by Aspen standards and within easy walking distance of downtown. Parking is at a minimum downtown so leave your car at the Lodge when you go shopping or to eat. We had a room with three beds (two queen and one single) and a kitchenette for about $100. Ken will take great care of you. Tell him I sent you. 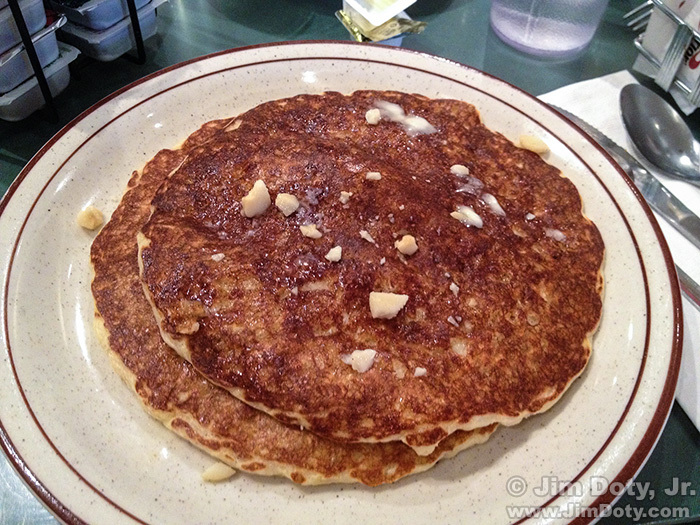 Oatmeal Buttermilk Pancakes at Poppycock’s Cafe, Aspen Colorado. September 24, 2015. I highly recommend Poppycocks Cafe (665 East Cooper) for breakfast. It was recommended to us by locals and it is an excellent recommendation. The Oatmeal Buttermilk Pancakes and sausage patties at Poppycock’s are every bit as good as the locals say they are. 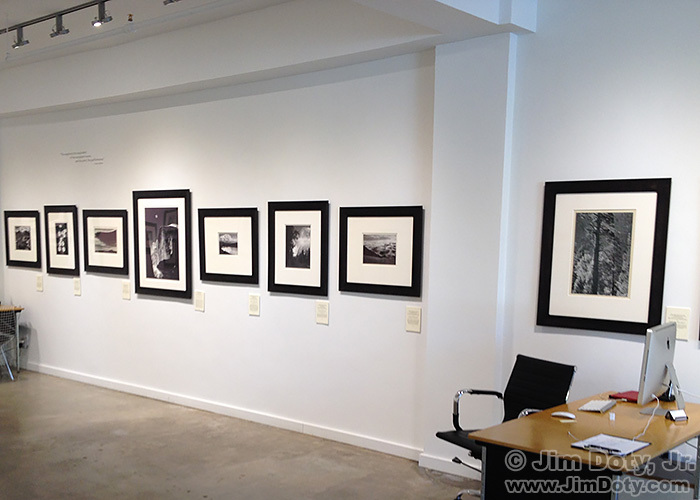 Some of the nice collection of Ansel Adams’ prints at the Quintenz Gallery, Aspen Colorado. September 24, 2015. While you are in Aspen be sure and stop at the Quintenz Gallery (613 Cooper Avenue) to see “Ansel Adams: Masterworks from Seven Decades, 1928-1972”. This is your opportunity to see an excellent collection of large prints by the grand master of American landscape photography. My 2015 trip to Aspen was the first time I have seen a large collection of Adams’ wonderful prints in person and I was blown away. The prices will blow you away too. “Moon and Half Dome, Yosemite (1960)” (the large vertical photo, fourth from the left) was $295,000. The fastest route to Estes Park is to drive up through Boulder and Lyons and on to Estes Park (two hours), but I recommend the scenic route (Peak to Peak Byway with a side trip to Brainard Lake) if you have the time (add an extra 1-3 hours with photo time). If you don’t have time for the scenic route on your way to Estes Park, I suggest you take this route on your way back to Denver and on to Montrose (see below). 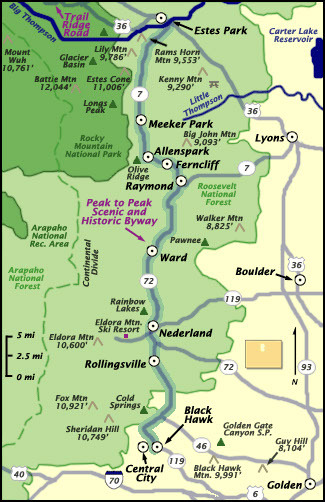 Colorado’s Peak to Peak Scenic Byway begins at Black Hawk and Central City and follows CO 119, CO 72 and CO 7 up to Estes Park. Black Hawk and Central City used to be quaint little mining towns but they have been taken over by casinos so I generally skip all of that. If you decide to drive the whole route the Central City Opera House is a historic building worth seeing and the “Face on the Bar Room Floor” of poetic fame is in the Teller House Bar in Central City. Peak to Peak Scenic Byway. Colorado highway 72 Between Nederland and Ward. September 23, 2016. I usually skip the southern half of the Scenic Byway. I take the shortest route to Boulder, take CO 119 from Boulder west to Nederland, and then take the Peak to Peak Highway from Nederland to Estes Park on CO 72 and CO 7. 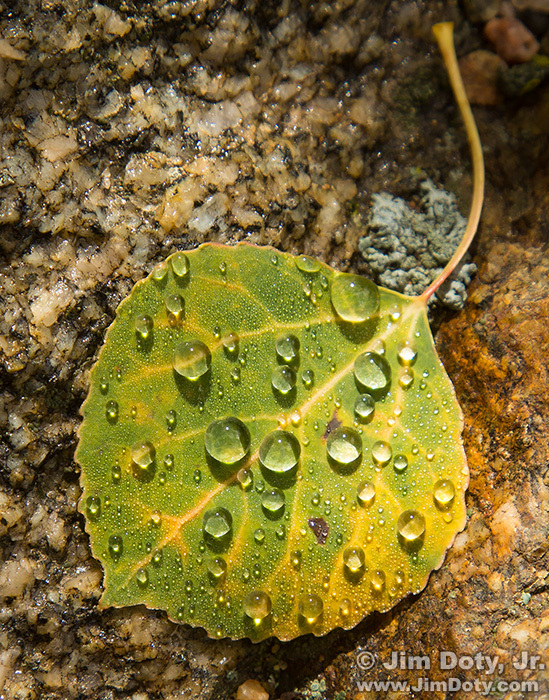 Aspen leaf and snow drops just off the Peak to Peak Scenic Byway. September 29, 2017. In addition to the classic overlooks along the byway with sweeping valleys filled with aspen and evergreens, head into the woods opposite the overlooks and look for small, intimate landscapes. An overnight snowfall had melted, creating “snow drops” on the aspen leaves. Brainard Lake Recreation Area, Ward Colorado. Click to see a larger version. 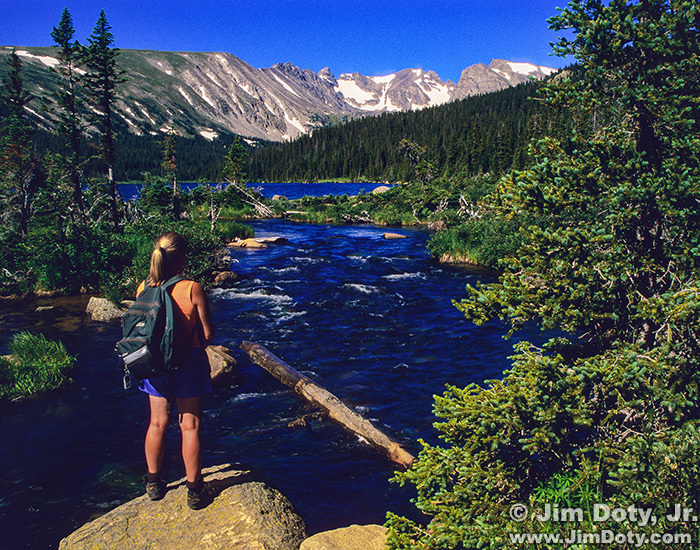 In addition to the high mountain scenery along the way, the real treat on the Peak to Peak Scenic Byway is a stop at the lakes of the Brainard Lake Recreation Area at the entrance to the Indian Peaks Wilderness. Near Ward Colorado on CO 72 you will see the turn off to the left to go to Brainard Lake and the Indian Peaks Wilderness. It is well worth the short drive of just a few miles to see Red Rock Lake and Brainard Lake. 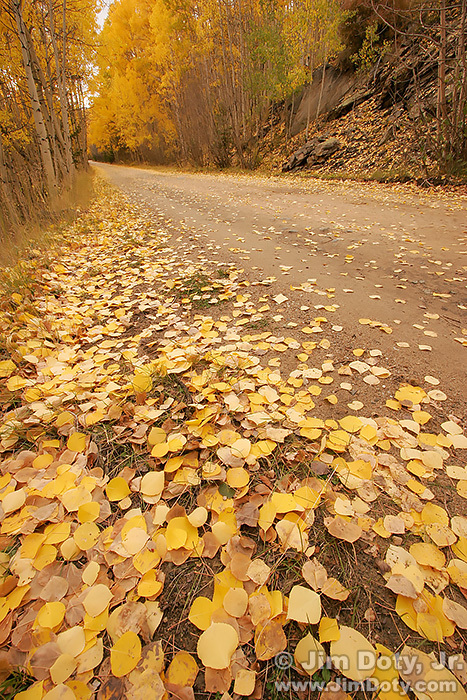 Aspen leaves along the road to Brainard Lake near Ward Colorado. September 23, 2016. Neither lake has aspen but there are some nice aspen groves along the road to Brainard Lake. Red Rock Lake, Indian Peaks Wilderness, Colorado. July 20, 1998. Red Rock Lake is close to the road on your left and farther up the road you will reach Brainard Lake. At Red Rock Lake the grass will gradually turn yellow in the fall, but the scene will be no less impressive than in this summer photo. This is a BLM fee area. If you have a Golden Eagle Passport that includes BLM sites or a Golden Age Passport it will get you in. If not, you will pay a small fee to get in. A lifetime passport for seniors is just went up to $80 and will get you in to any national park or BLM area for as long as you live (or until you lose the card or the government changes the deal). Brainard Lake, Indian Peaks Wilderness, Colorado. July 30, 2007. 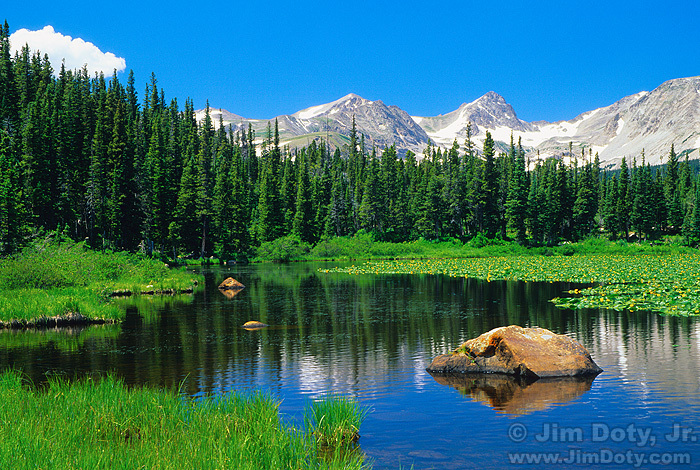 You can photograph either lakes with the Indian Peaks in the background. Hiker at the stream flowing out of Long Lake. Indian Peaks Wilderness, Colorado. July 20, 1998. On the road around Brainard Lake there is short drive to a parking lot for the trail to Long Lake. It is well worth the 5 minute walk on level ground. If you are looking for a place to eat near Brainard Lake, stop at the Millsite Inn just north of Ward on CO 72. Link below. I’ve been there several times and the food and service were good every time except for the last time (September 2015). On my most recent visit the service was very slow, the French fries were limp, but the sandwich was good. I hope things are better on future trips. Keep your eyes peeled the last few miles before you get to Estes Park on CO 7. I have seen elk near the road on several occasions. Have your camera and a long lens ready to go. As you approach Estes Park from the south on CO 7, look for Marys Lake Road on your left. It is a short cut to the west side of town and will save you time spent fighting a lot of tourist traffic in the downtown area. 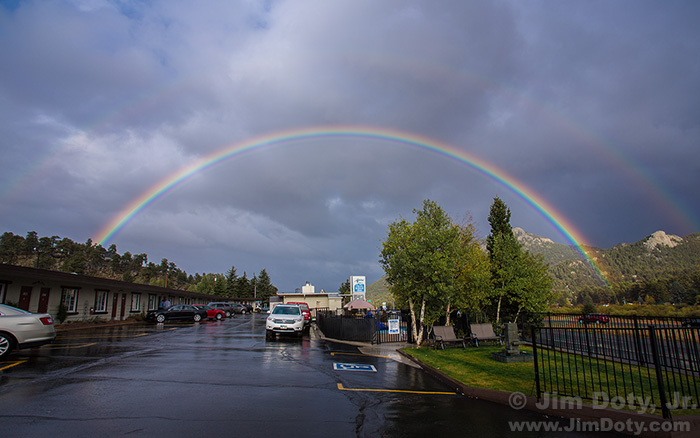 Double Rainbow, Alpine Tail Ridge Inn. Estes Park, Colorado. September 28, 2014. My favorite places to stay in Estes Park are the Alpine Trail Ridge Inn and Colorado Cottages. They are both on the west side of town near the intersection of Marys Lake Road and U.S. 36. 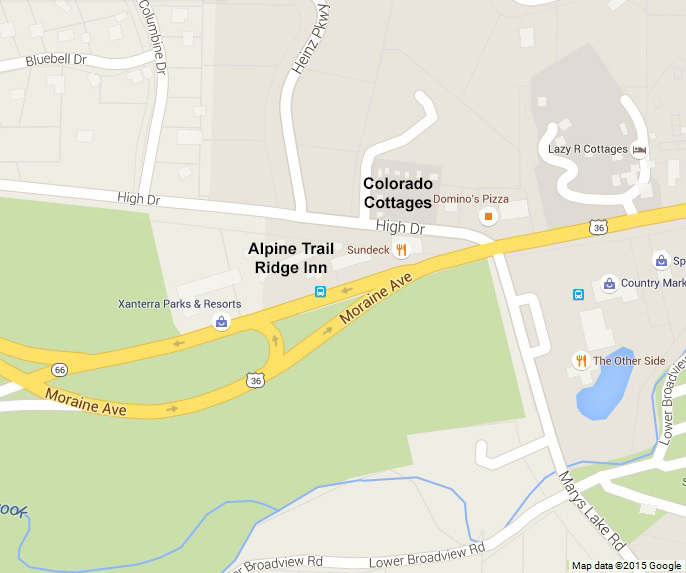 Alpine Trial Ridge Inn is on US 36 and Colorado Cottages is right behind the Alpine Trail Ridge Inn on High Drive. Both locations get you quickly into Rocky Mountain National Park without contending with all of the tourist traffic downtown. I have been staying at the Alpine Trail Ridge Inn for 20 years and at Colorado Cottages for 10 years. Back when the Alpine Trail Ridge Inn closed in mid-October for the winter, the manager of the Inn suggested I stay at Colorado Cottages whenever I was in town in the winter. It was an excellent suggestion. I still remember sitting in the hot tub one cold February night while snow flakes landed on my face. It was magic. The Alpine Trail Ridge Inn is now open all year so I stay at one place or the other depending on who is booked up or whether I am in a motel mood, or rustic cabin mood. Colorado Cottages changed hands three years ago and is now run by Mark and Natasha. They are both super nice and will take great care of you. Tell them I sent you. Alpine Trail Ridge Inn changed hands over a one year ago. Ask to speak to Debby if she is in the office when you call. Tell her I sent you. Links to both places are below. My favorite places to go for a real sit down meal in Estes Park are the Sundeck Restaurant (which is being remodeled and renamed) right next to the Alpine Trial Ridge Inn, and Smokin’ Daves BBQ a few blocks east. Links below. Scratch is a new sandwich place and I happened to be there September 25, 2015, the day they opened. All the food is made from scratch and the sandwiches are tasty and huge. Scratch is open from 7 am to 4 pm. For breakfast they have a selection of breakfast burritos plus cinnamon rolls and sticky buns. Scratch is at the corner of Moraine Ave and St. Mary’s Drive in the former Domino’s Pizza building (map above) and is a good place to eat if you don’t have time for a sit down dinner. Most of the time I am so busy taking pictures that I grab something fast to eat not far from where I am staying, but at least once or twice I like a real meal. There are several grab and go places like Scratch or Baba’s Burgers and Gyros not far from the Inn and Cottages on Moraine Avenue. I usually grab some milk, cereal, bread and sandwich fixins at the Country Market nearby (or Safeway on the east end of town) so I can fix my own breakfast and get an early start, or make my own quick lunch to take with me. The Inn and the Cottages both have a large or small fridge in each room/cabin. If you are looking for a nice sit down dinner after a long day of photography, try The Other Side restaurant (map above) which is close to the Inn and Cottages just diagonally across the main intersection. 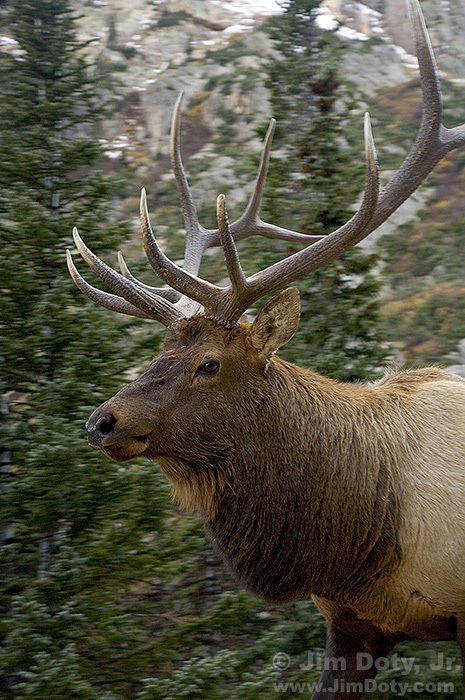 In the fall, Rocky Mountain National Park is all about the elk rut and the golden aspen leaves. 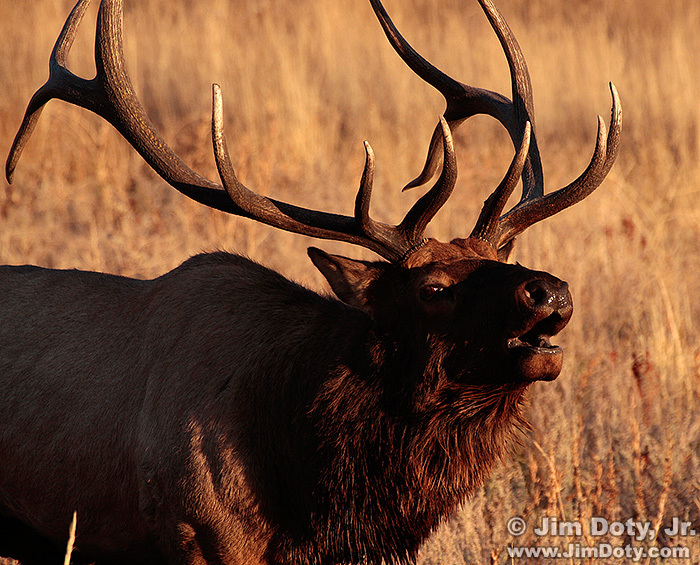 Fall is the best time to see elk when the big bulls are gathering harems in the meadows at the Park’s lower elevations. The rest of the year the bull elk tend to be in the trees or up on the tundra. 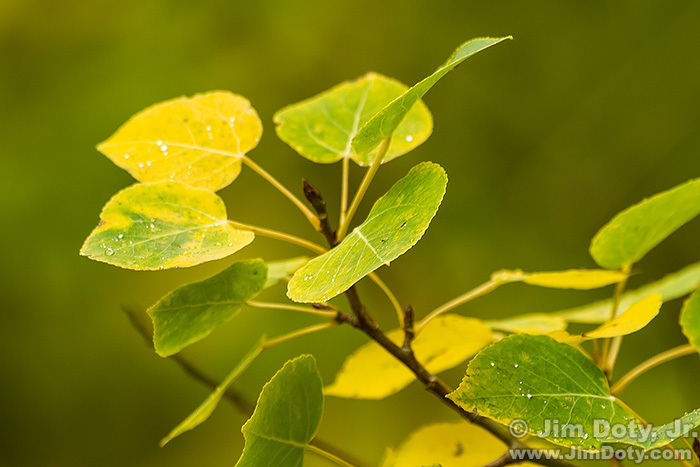 The aspen leaves are also changing from green to gold so it is a great time of year. As I said earlier, the last two weeks in September are generally the peak season for fall colors and vary a bit with the elevation. If I had to pick one week it would be the last week in September but the color hangs on longer some years than others. Of course the Park has spectacular mountains, lakes, rivers and streams year around, but a lot of people come in the fall to see the golden aspen leaves (and motels book up quickly so book early). 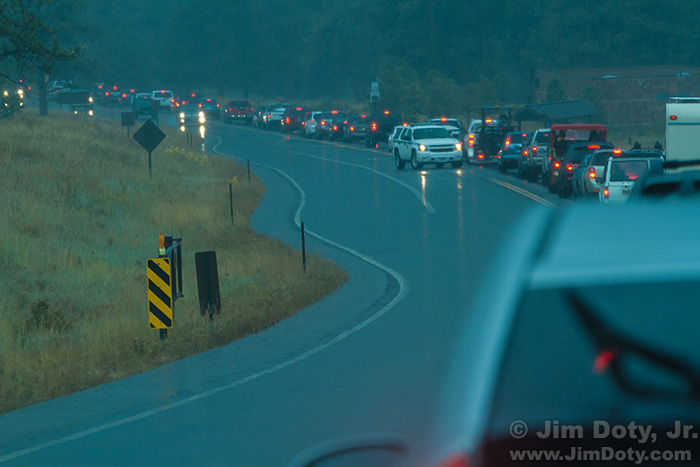 Cars lined up in the rain waiting to exit Rocky Mountain National Park. Sunday evening, September 28, 2014. Elk and aspen bring a lot of people to Rocky and it can be especially busy on a fall weekend. Don’t be surprised if you run into long lines of cars getting into and out of the park. It is better to come to Rocky between Sunday afternoon and Friday afternoon.. The primary elk locations. Click to see a larger version. The elk will be where they choose to be and that can vary a lot from year to year and even day to day. One fall there were three large harems of elk in Upper Beaver Meadows, with several competing bulls and over 100 cow elk, and the next year in the same location there were none. 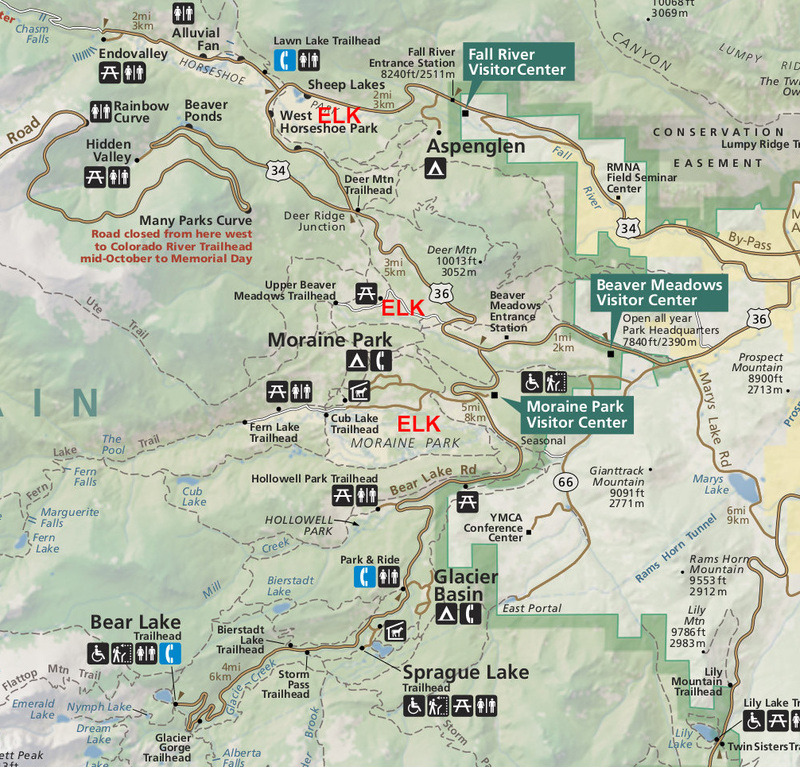 My preferred elk locations, going from north to south, are Horseshoe Park, Upper Beaver Meadows, and Moraine Park. All three areas are marked on the map. When you are looking for elk just go from one location to the next until you find some elk. The best time of day is usually in the evenings, so I tend to do elk photography in the evening and landscape photography in the morning. 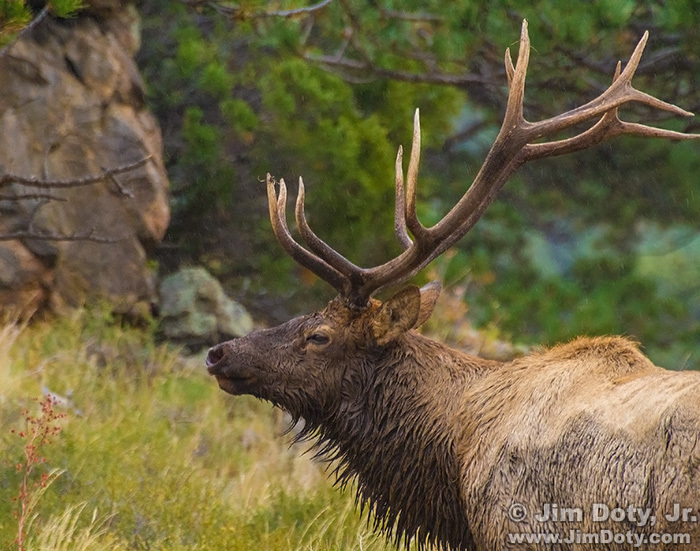 Bull Elk in the Rain. 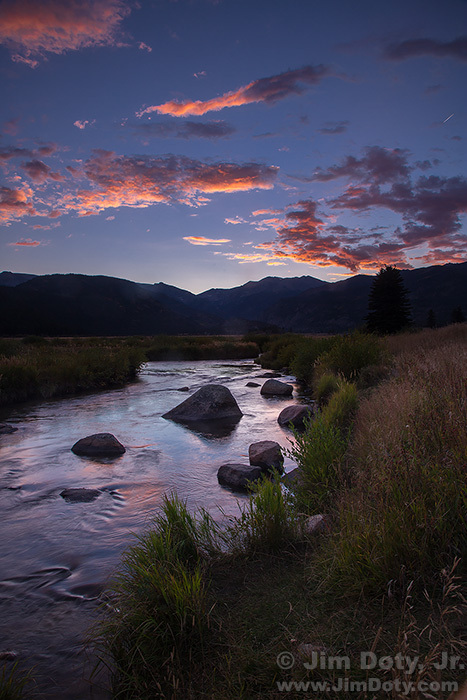 Upper Beaver Meadows, Rocky Mountain National Park, Colorado. September 30, 2014. To get to Horseshoe Park, take U.S. 36 into the park through the Beaver Meadows entrance. When you get to the turn off to the Upper Beaver Meadows Trailhead, you might as well turn left on the dirt road and see if you can spot some elk along the dirt road. If you don’t see any elk in the first half mile of the road, turn around at the helicopter landing pad, go back to U.S. 36, turn left on U.S. 36, drive to Deer Ridge Junction and turn right to go north to Horseshoe Park. As you drive down hill, look for the parking lot on the right with the rocky outcropping. You can stop and look down into Horseshoe Park. If there are any elk around you will see a lot of cars lined up along the road. This overlook is also a good scenic location. Bull elk, Endovalley Road, Rocky Mountain National Park. September 27, 2017. Be sure to drive the road from Horseshoe Park to the picnic area at Endovalley. Both elk and deer can be spotted along this road. Bull Elk Bugling, Moraine Park, Rocky Mountain National Park, Colorado. October 3, 2010. The other option is to take U.S. 36 into the Park and turn left on Bear Lake Road. You will drive over a ridge and down into the east end of Moraine Park. Just past the Moraine Park Visitor’s Center on your left you will see the road into Moraine Park on your right. Drive along this road and look for elk. They will usually be in the large grassy meadow to your left, but they can be anywhere. It is worth driving all the way to the end of the road. On the west end of the road keep an eye out for elk in the bushes next to the river. Moraine Park, year after year, is usually one of the best elk locations. 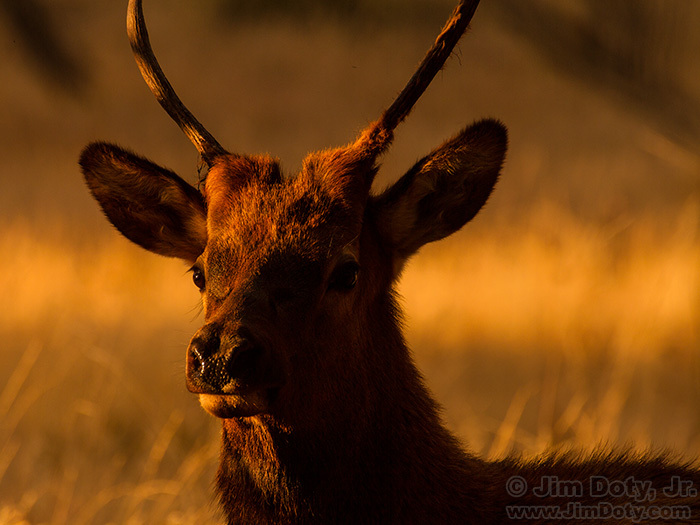 Young Bull Elk at Sunset, Moraine Park, Rocky Mountain National Park, Colorado. September 26, 2014. The last elk option after leaving Moraine Park is to go back to Bear Lake Road, turn right and follow the road toward Bear Lake. Look for Hollowell Park on your right. You are less likely to find elk here than the other three locations so you should only go here if you haven’t found elk at the other three locations. 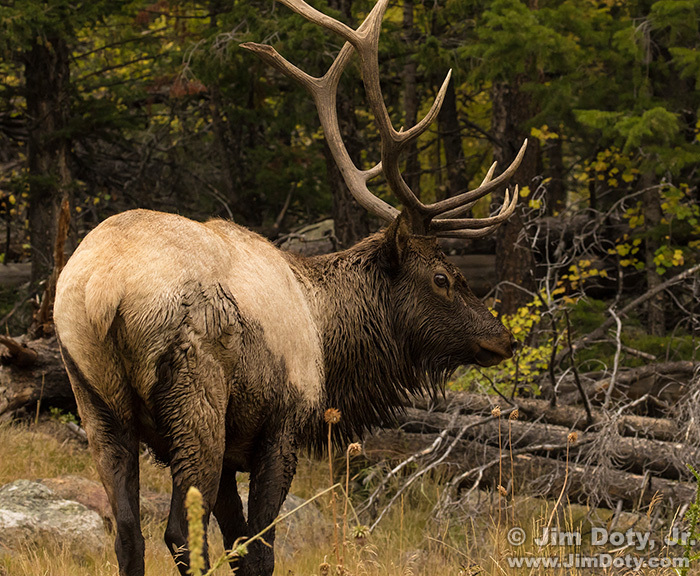 Bull Elk, Fall River Road, , Rocky Mountain National Park, Colorado. 24-105mm lens at 60 mm. October 5, 2007. While I wouldn’t normally recommend trying to find elk on Fall River Road, sometimes you find elk where they aren’t expected. On frustrating week in October when elk were hard to find in all the usual locations, I drove up Fall River Road to do some landscape photography. To my surprise I saw a big bull elk walking slowly down the road. All the cars on the road stopped to watch and the elk was taking his own sweet time. Fall River Road is a one lane, one way dirt road going up hill so the elk was only a few feet from all the cars. I put on my 24-105mm lens and waited, snapping the shutter as he passed by. I was the last person to get a good photograph. In her excitement a woman in the car behind me stood up through her sun roof and started screaming “It’s an elk, it’s an elk!” It was too much for the elk and he bolted over the lip of the road and dropped down out of sight before she could get her point & shoot camera up to her face. Maybe the bull bolted because he was offended by her camera. (wink) Prior to the screaming woman, everyone else had kept their cool as the elk sauntered by. She spoiled the opportunity for all the people in the cars behind her. 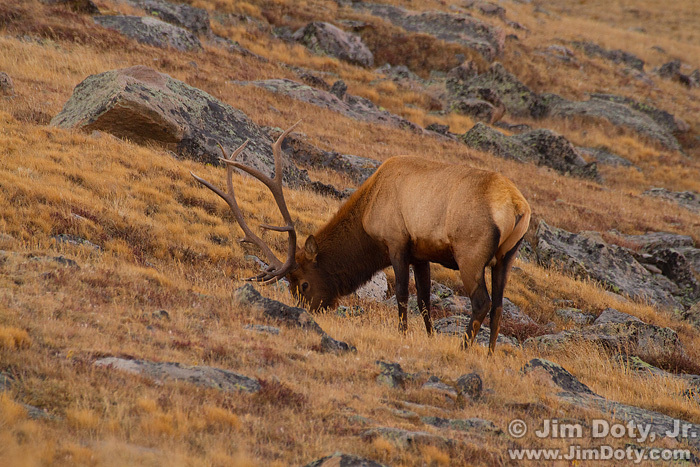 Bull Elk, Trail Ridge Road, Rocky Mountain National Park, Colorado. October 4, 2010. Although most of the elk are down in the meadows at lower elevations during the fall rut and remain at lower elevations through winter, you will occasionally find a lone bull up on Trail Ridge Road. Fall River Road up to the Alpine Visitor’s Center and Trail Ridge Road back down toward Deer Ridge Junction. Fall River Road is a distance and time commitment. 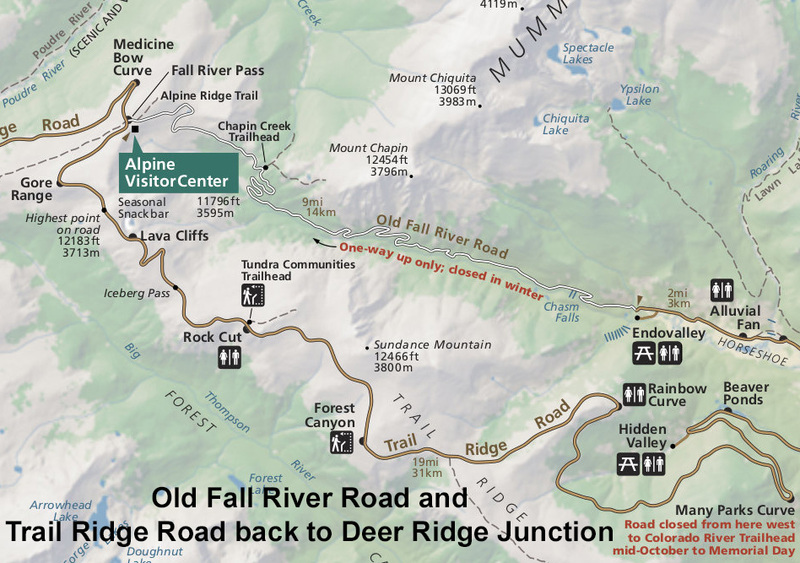 Since it is a one way, one lane road, once you start up the road you have to keep going until you reach Trail Ridge Road at the Alpine Visitor’s Center, a distance of 9 miles. From there you drive back down Trail Ridge Road to get back to the east side of the Park and Estes Park. It is another 19 miles from the visitor’s center back down to Deer Ridge Junction. Don’t start up the road if there is bad weather or a good chance of snow. Although most people think elk when they come to Rocky in the fall, they aren’t the only wildlife that are out and about. In a good year you will see a lot of deer. They can be most anywhere. Just keep your eyes open. 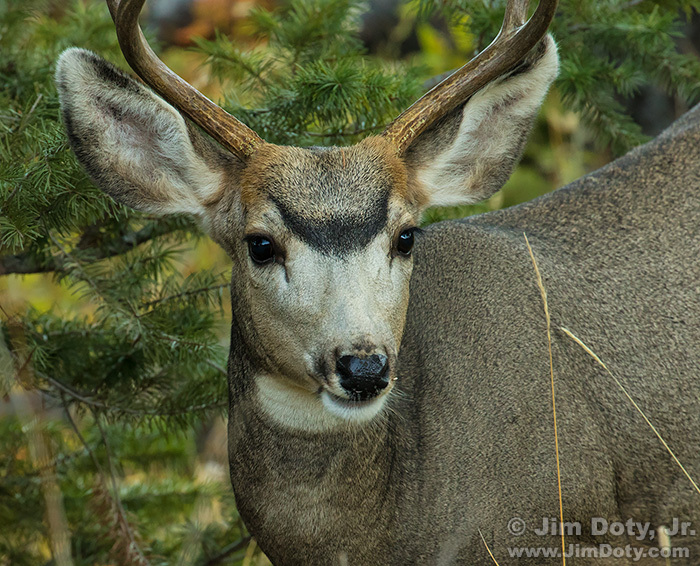 Buck near Endovalley Road, Rocky Mountain National Park. September 26, 2016. While deer can be anywhere, one of my favorite locations to find deer is along Endovalley Road. “The Deer from Hell.” Rocky Mountain National Park, Colorado. August 26, 2004. A word to the wise. On cloudy days professional photographers often create a catch-light in an animal’s eyes by using a bit of fill flash. However, that is ill advised when it comes to deer. 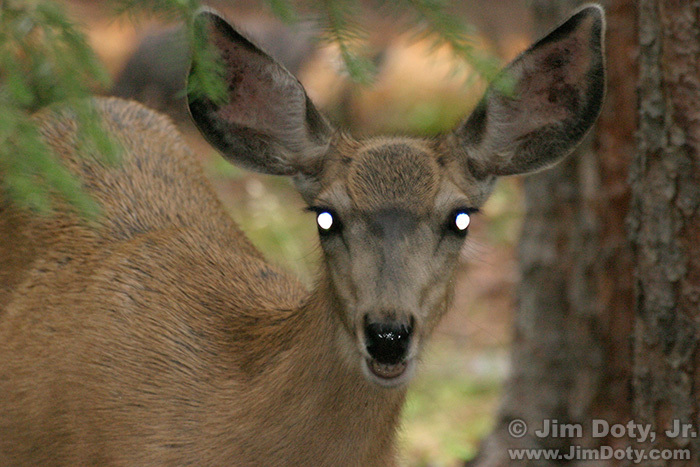 I did take a normal photo of this deer before this failed flash experiment. Steller’s Jay near Bear Lake. September 28, 2014. 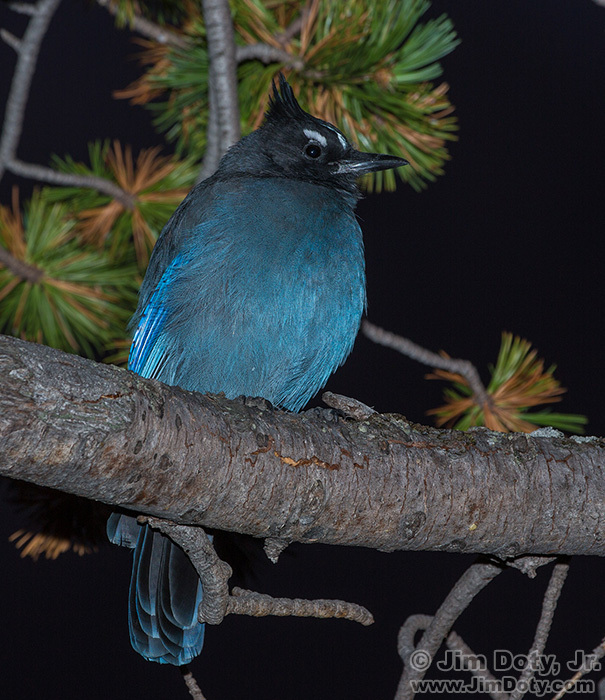 I did use flash for this photo of a Steller’s Jay. It was early in the morning and I was waiting for sunrise when this jay landed in a branch near my head. It was too dark for a natural light photo of an active bird so flash was a necessity. 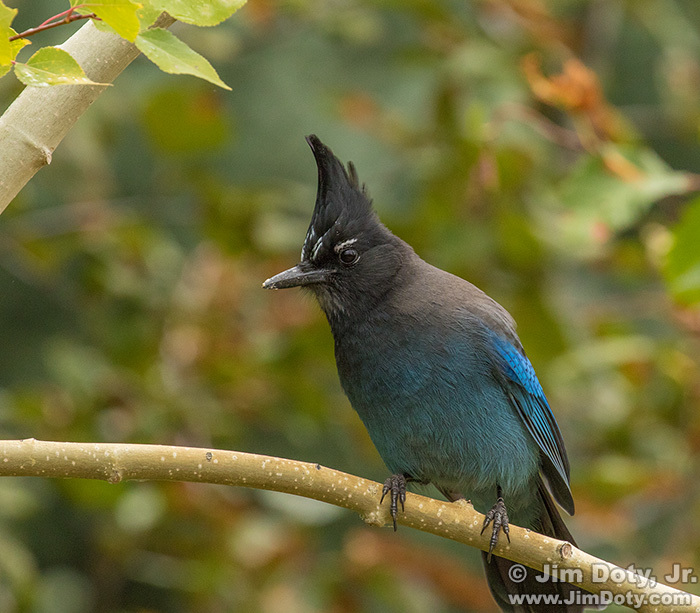 A relative of the blue jay, Steller’s Jays are quite common in the Park. They hang out near people areas in hopes of finding food. Don’t feed them but do take a picture. 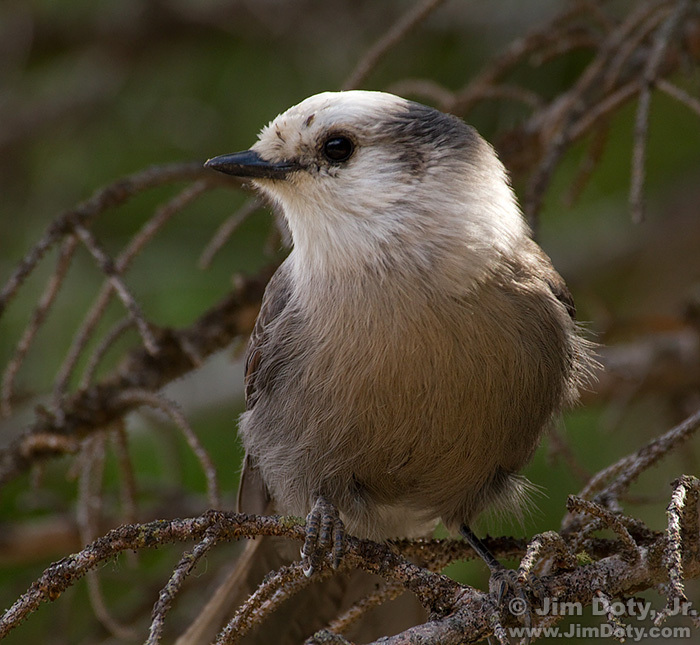 Gray Jay, Bear Lake. Rocky Mountain National Park, Colorado. October 3, 2010. A lot of birds are still active in the park in the fall, and if you are lucky one might land very close to you. I was at one of my favorite spots on the south side of Bear Lake (at the bench) taking landscape photos with a wide angle lens when this Gray Jay landed in a tree not far away. It wasn’t there long. I grabbed my other camera body and long lens and took this photo. There is a lesson in all this. You need to be ready for unexpected opportunities. If I had to take time to switch from a wide angle to a telephoto lens, the jay would have been long gone. When I am in Rocky I usually have two camera bodies ready to go, one with a normal to wide angle lens and the other with a telephoto lens (see the photo below). That saves me from some missed opportunities. If you are using a camera with an all-in-one zoom lens that goes from wide angle to telephoto, you don’t have to worry about this. Just zoom and shoot. If not, it is a good idea to have a backup camera body. This can be anything from an inexpensive point and shoot camera with a wide to telephoto zoom lens, or a second DSLR. Two camera bodies with lenses ready to go. South side of Bear Lake, Rocky Mountain National Park. October 3, 2010. 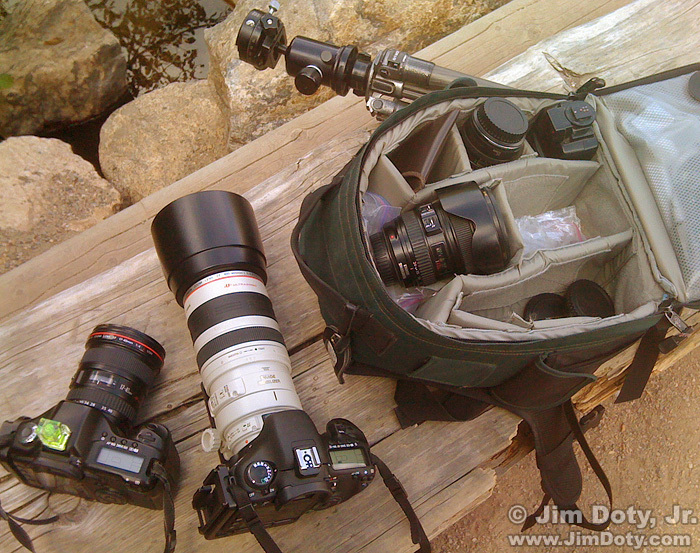 This is the equipment I had with me when the Gray Jay landed nearby. Note the camera with a wide angle lens and double bubble level that I was using to do landscape images, and the telephoto lens on the other camera. I took this photo with my iPhone a few minutes after I photographed the Gray Jay. 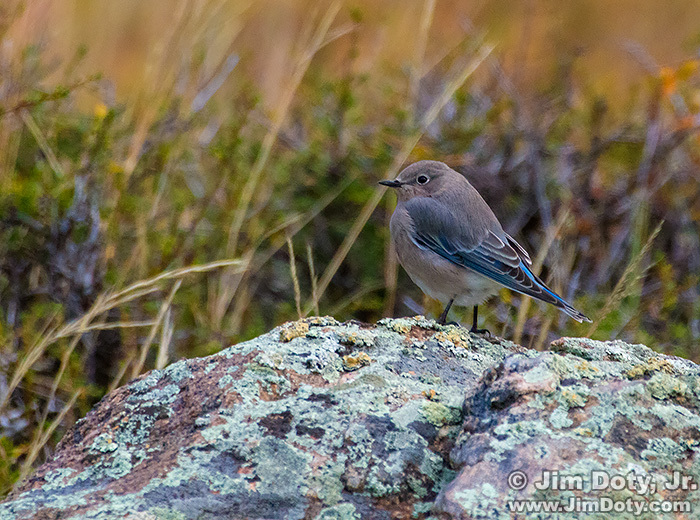 Female Mountain Bluebird. Rocky Mountain National Park, Colorado. September 30, 2014. If you see a flash of blue and it is much smaller than a Steller’s Jay, it is most likely a Mountain Bluebird. Males are covered in cerulean blue and females are grayish-brown with a touch of blue in the wings and tail. I usually see them in meadows. 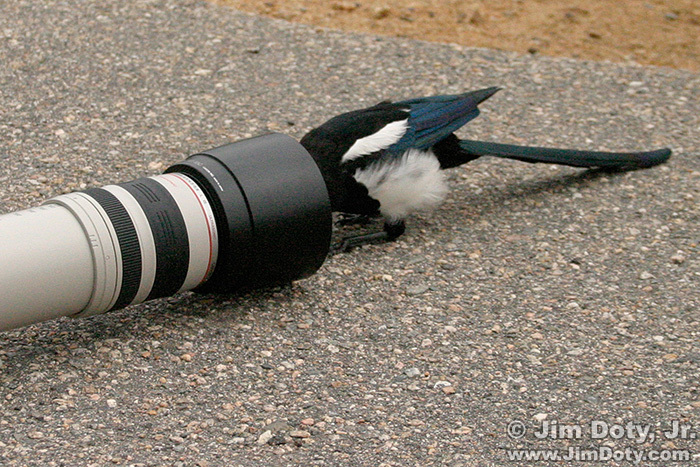 Magpie Meets Lens. Parking lot, Horseshoe Park. Rocky Mountain National Park, Colorado. August 27, 2004. A magpie decides to check out my telephoto lens. Not sure why, but it might have been intrigued by its own reflection on the front element of the lens. Brook Trout in the stream just west of Sprague Lake. Rocky Mountain National Park, Colorado. October 5, 2005. When you are at Sprague Lake, look in the stream that pours into the west end of the lake. 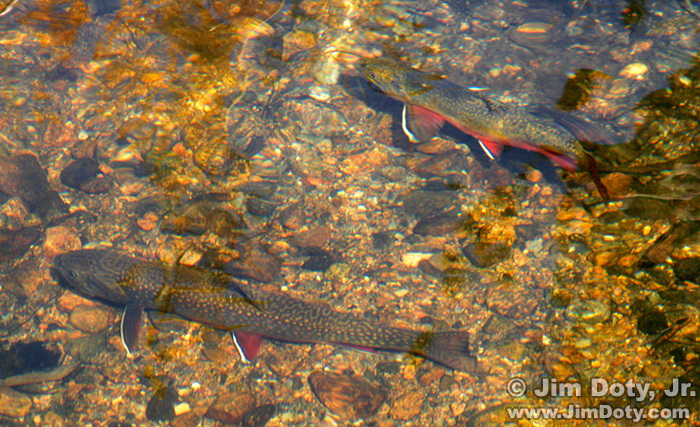 You will almost always see Brook Trout, notable for reddish fins with white and black streaks on the leading edges. Brook Trout are an introduced species that are not native to the area. 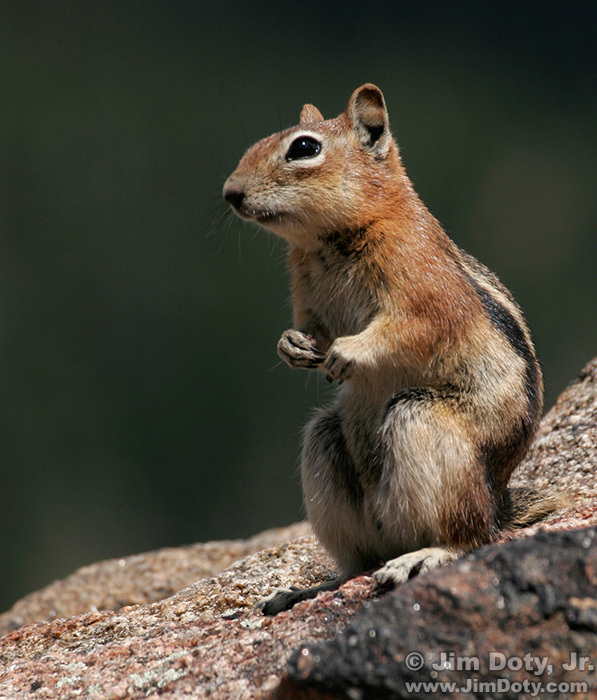 Golden Mantled Ground Squirrel, Rocky Mountain National Park, Colorado. August 18, 2008. The Golden Mantled Ground Squirrel is a true hibernator and heads underground with the first snow and colder temperatures. Depending on how early you are in Rocky and how long the temperatures stay moderate, you just might see one. 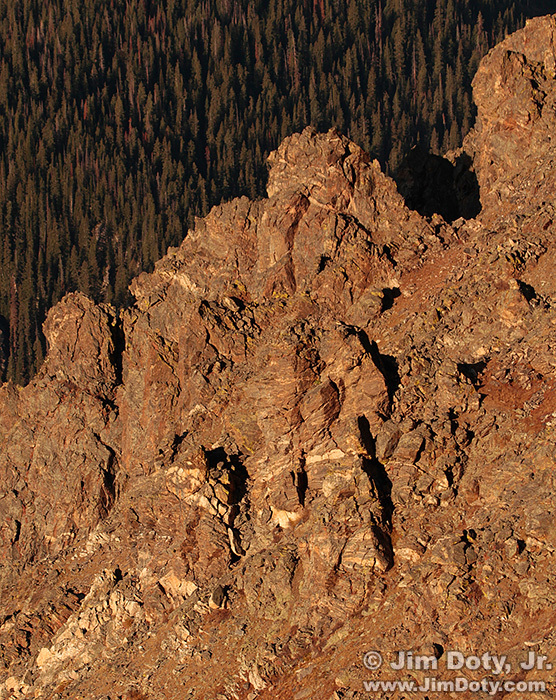 A favorite location is the rocky overlook northwest of Deer Ridge Junction. Other squirrel species in the Park are active throughout the fall and can be found most anywhere. Wyoming Ground Squirrel. Moraine Park, Rocky Mountain National Park, Colorado. June 9, 1997. 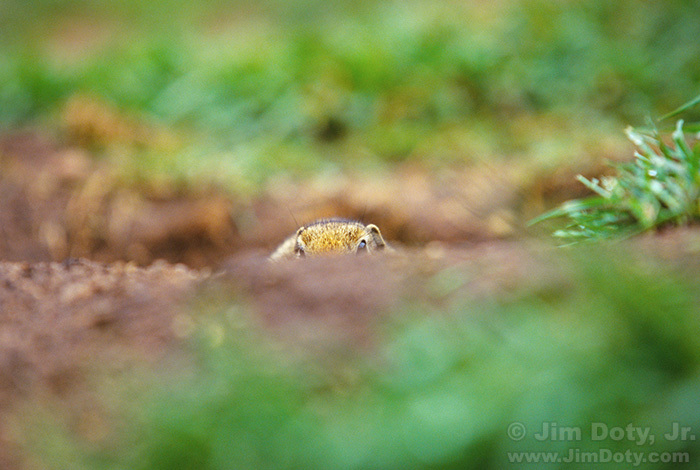 This Wyoming Ground Squirrel is checking me out before leaving its burrow. Wyoming Ground Squirrels are found in open areas like the park’s meadows and hillsides without thick tree cover. They they like to stand upright by their burrows which is why they are occasionally mistaken for prairie dogs. Coyote, Rocky Mountain National Park, Colorado. October 5, 2005. 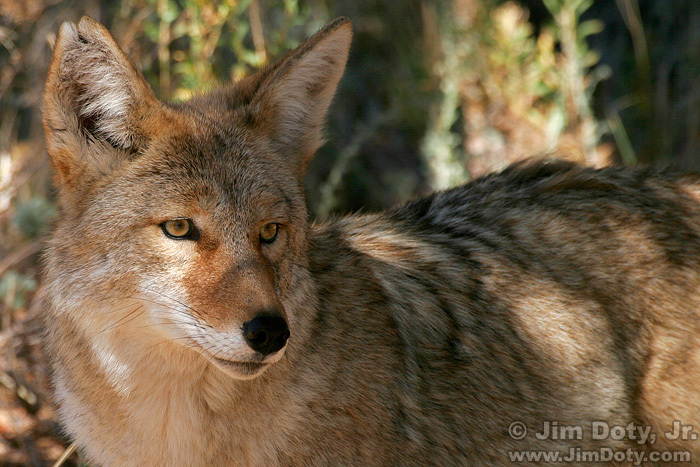 Coyotes are active year around, but they are a bit elusive and usually seen only from a distance Keep your eyes open and be ready for that rare moment when you can get a classic shot. 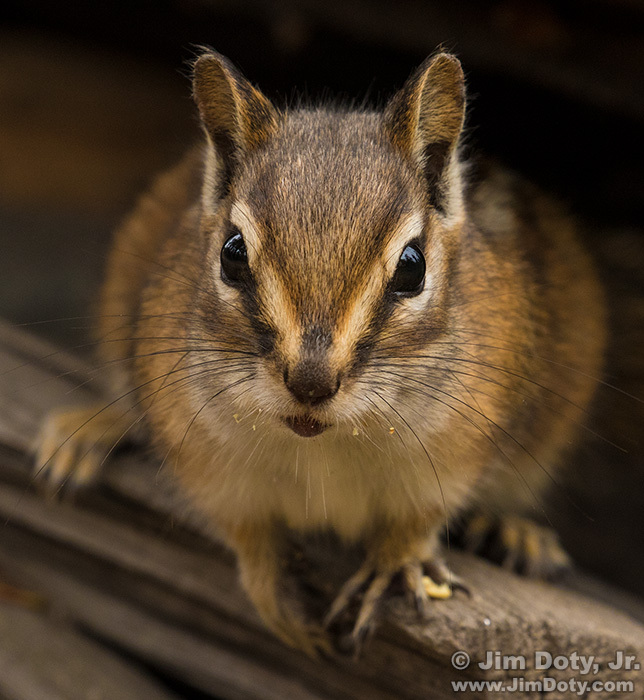 Chipmunk, Alluvial Fan area, Rocky Mountain National Park. September 27, 2017. Chipmunks will still be out and about in September and early October. This chipmunk was eating grass seeds just west of the Alluvial Fan. There are parking lots on both the west and east sides of the alluvial fan. The area around both parking lots is a good place to look for small mammals and birds. Steller’s Jay, Alluvial Fan area, Rocky Mountain National Park. September 27, 2017. This Stellar’s Jay was near the trail that leads west from the parking lot that is just east of the Alluviual Fan. Ducks feeding at Sprague Lake, Rocky Mountain National Park. September 29, 2017. 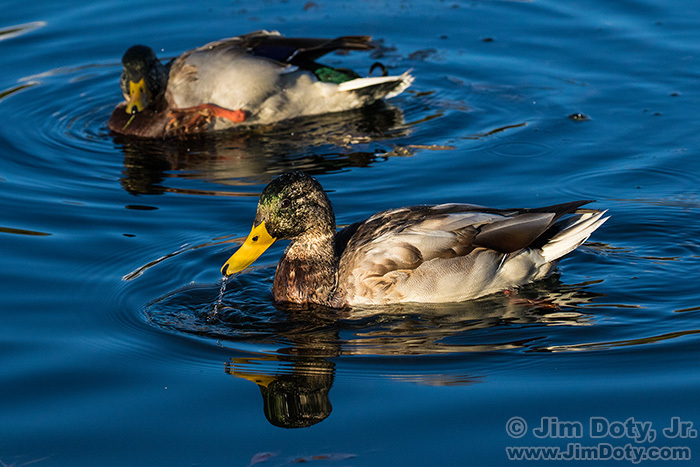 There are plenty of ducks in the park and they are often spotted feeding in many of the lakes and ponds. Scenic locations. Click to see a larger version. 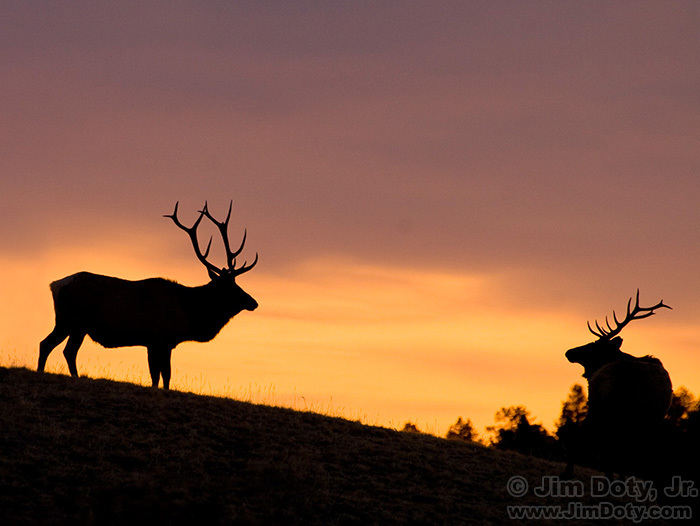 Some of the elk locations are also good for scenic photography. On the way to Horseshoe Park there is a nice stand of aspen to your left as you drive down the road from Deer Ridge Junction. The photos immediately above and below were taken on the same day near the same curve in the road. In these two photos you see aspen at the peak of fall color, aspen half turned, and aspen leaves just beginning to turn. 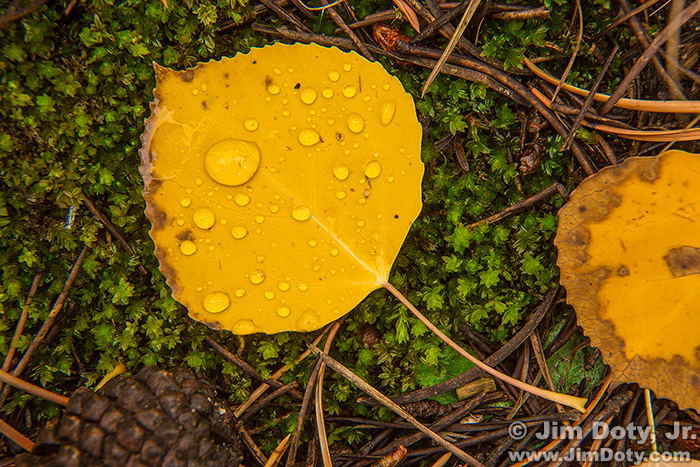 Aspen Leaves, Horseshoe Park, Rocky Mountain National Park, Colorado. September 28, 2014. This aspen grove is not more than 200 yards from the two photos above that were taken September 28, 2014. It was taken October 11, 2007 and you can still see trees at their peak of color plus some that are dropping their leaves. In my experience, the color usually doesn’t hang around quite this long in Horseshoe Park. 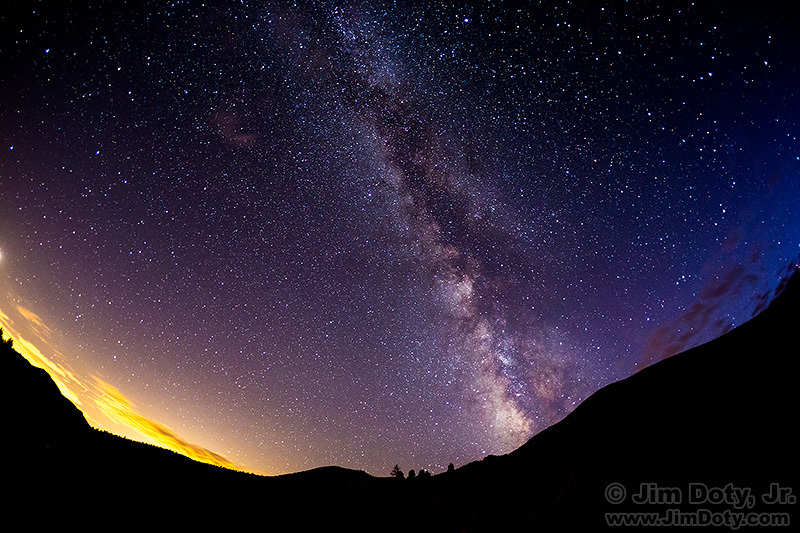 Milky Way from Horseshoe Park, Rocky Mountain National Park. September 27, 2015. On a dark, clear night with minimal clouds and no moon, Horseshoe Park is a good place to shoot the Milky Way. Put your camera on a tripod, use your widest angle lens, turn off autofocus and carefully focus your lens manually on infinity, set the ISO to 3200 or 6400, use an aperture of f/4, and a shutter speed of 20 – 30 seconds. There is another nice stand of aspen at the east end of Moraine Park. You can drive up to the parking lot at the Moraine Park Visitor’s Center and photograph the aspen in the foreground and the mountains to the west. This is a morning location. Dusk, Big Thompson River, Moraine Park. Rocky Mountain National Park, Colorado. September 26, 2014. At the southeast corner of Moraine Park there is a small dirt parking lot where South Moraine Road meets Bear Lake Road. There is a trail leading up to a gated fence (the fence is to keep the elk from over-browsing along the river). Inside the fence you can walk along the Big Thompson River. It is a great location early in the morning and at sunset. Aspen Grove along the road through Moraine Park, Rocky Mountain National Park, Colorado. October 12, 2007. If you drive down the road through Moraine Park all the way to the west end of the road you will see several nice aspen groves where you can create some intimate (small scale) landscapes. Twilight, Moraine Park, from the visitor’s center parking lot looking southwest. Rocky Mountain National Park, Colorado. February 26, 2008. 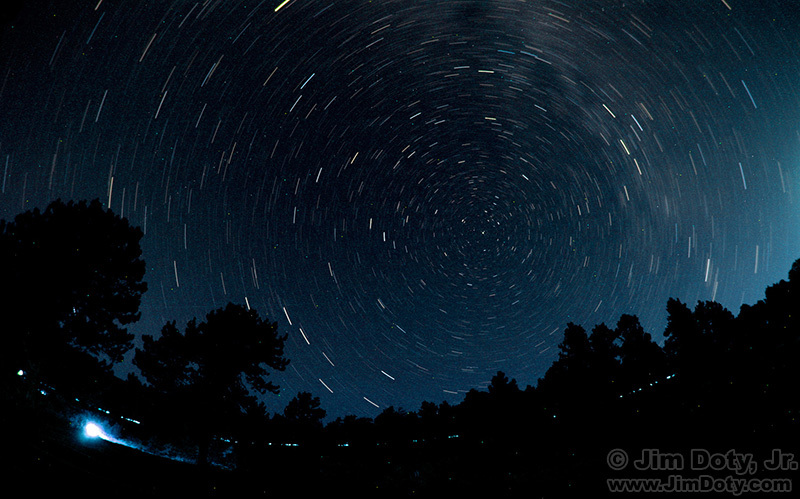 Star Trails, Moraine Park, from the visitors center parking lot looking northwest, Rocky Mountain National Park, Colorado. Click to see a larger version. September 30, 2010. The parking lot at the Moraine Park Visitor’s Center is also a good place to do twilight and night time photography. 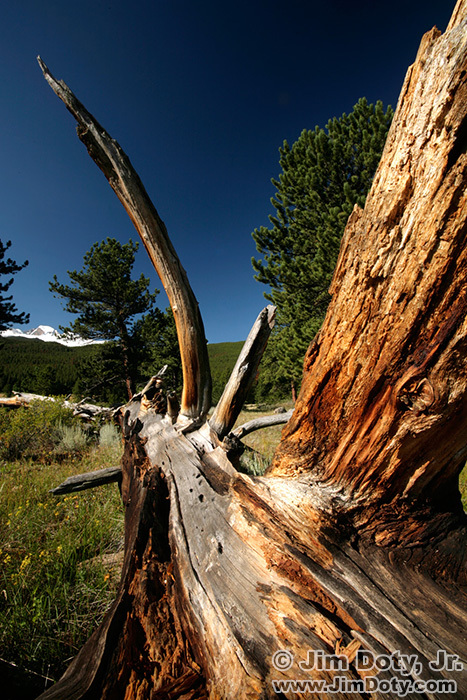 Fallen Tree and Long’s Peak. Hollowell Park, Rocky Mountain National Park, Colorado. August 18, 2008. In Hollowell Park you can shoot south toward Long’s Peak. Looking west from the Hollowell parking lot, there is also a small stand of aspen on the hillside with leaves that turn orange some years. Very cool. Aspen along Bear Lake Road. September 25, 2016. 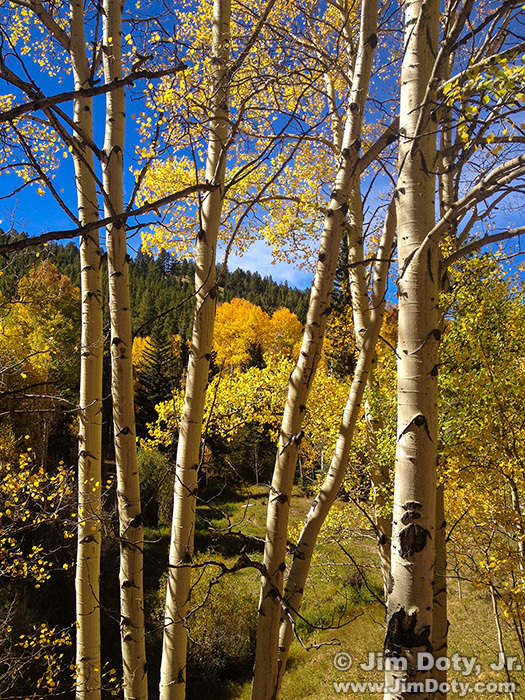 There are a number of nice stands of aspen along the road to Bear Lake. There are a lot of places that you will want to stop and take pictures. Storm Clouds over Hallet Peak and Flattop Mountain. Rocky Mountain National Park, Colorado. October 1, 2014. This is a view of the shooting location at the Storm Pass Trailhead. You can see the parking lot to the right. By hiking up top this little rise you can use a short to medium telephoto lens to shoot over the parking lot and the people on the trail. Dawn at Sprague Lake Looking East. Rocky Mountain National Park, Colorado. October 1, 2014. Sprague Lake is my favorite place to be at dawn. Arrive long before sunrise to catch the early morning light which can occasionally be spectacular. The short road to the parking lot is on your left as you drive along Bear Lake Road. This is not an aspen location. 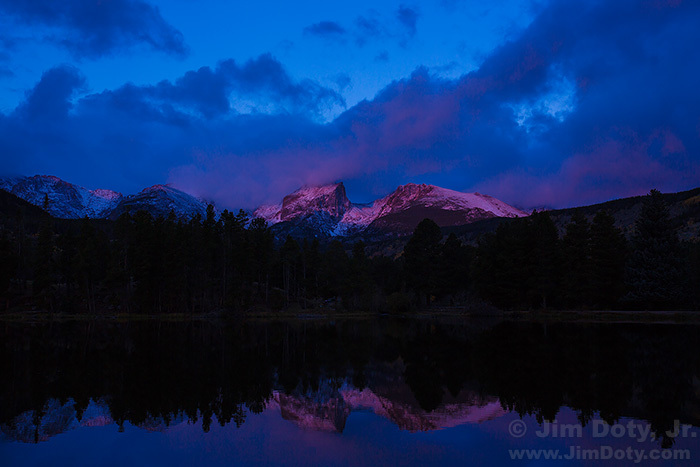 Dawn at Sprague Lake, looking west at Hallett Peak and Flattop Mountain, Rocky Mountain National Park, Colorado. October 1, 2014. Which side of the Sprague Lake you should be on depends on the morning light and whether you want to be facing east or west. Sometimes both directions look great. The two photos immediately above were taken on the same morning. 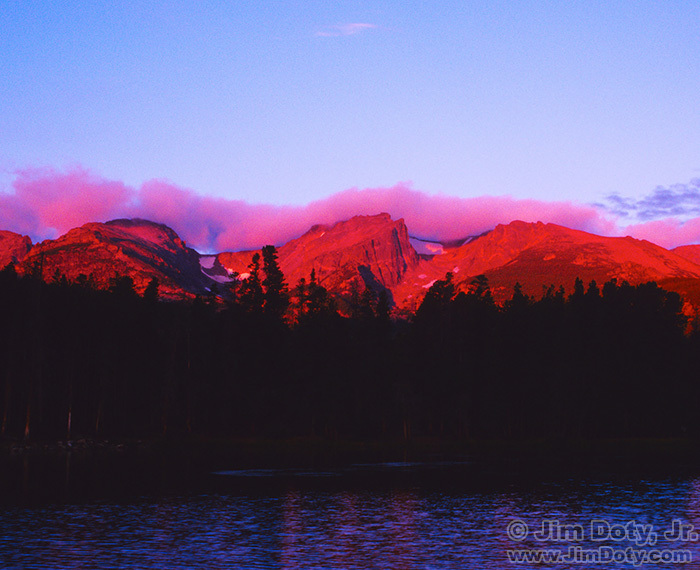 Sprague Lake, Alpenglow on the Peaks. Rocky Mountain National Park, Colorado. September 17, 1996. Sprague Lake Panorama. Rocky Mountain National Park, Colorado. Click to see a larger version. August 28, 2004. Hallett Peak, and Flattop Mountain reflected in Sprague Lake. Rocky Mountain National Park, Colorado. October 2, 2010. The south side of Sprague Lake looking west gives you a little different perspective and you can use evergreens to frame the left side of your photo. 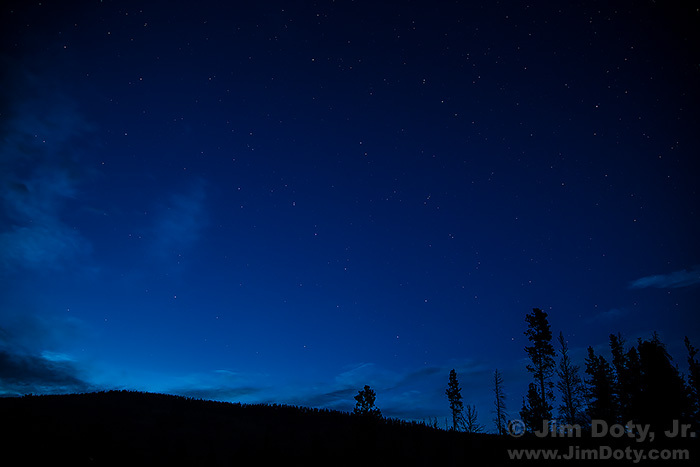 The Night Sky from Sprague Lake. Rocky Mountain National Park, Colorado. September 27, 2014. 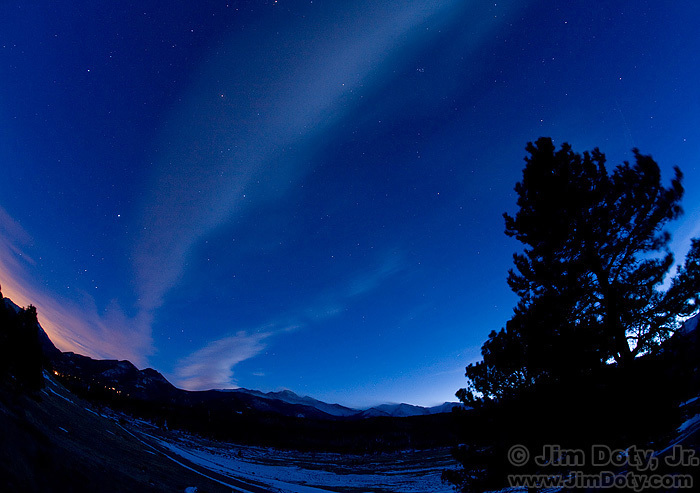 Sprague Lake is also a nice location to photograph the night sky. Bear Lake looking west at Hallet Peak. Rocky Mountain National Park, Colorado. July 18, 1998. 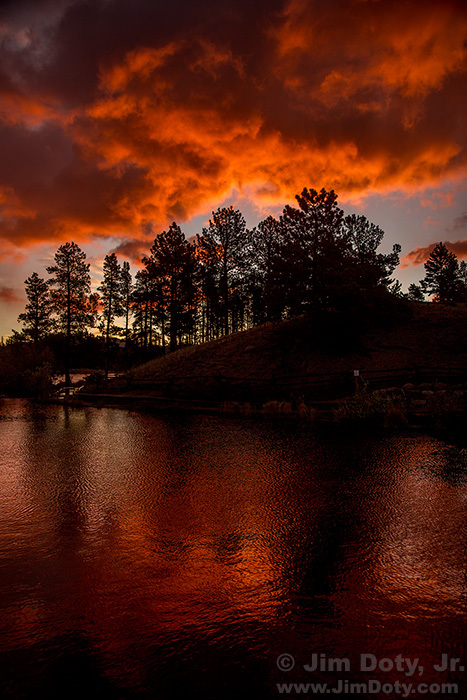 As soon as the sunrise show is over at Sprague Lake, head for Bear Lake which looks best early in the morning (and again later in the afternoon). The short walk from the parking lot to the lake takes you right to a viewpoint looking west across the lake at Hallett Peak. I would suggest you wander around a bit and find a downed log or large rock to include in the foreground of your images. When you are done at this location, go around the lake counter clockwise to the north side. Long’s Peak and Bear Lake from the Boulder Field, looking south. Rocky Mountain National Park, Colorado. October 3, 2010. The only stand of aspen at Bear Lake is along the north side of the lake with a large boulder field among the aspen. If you go past the boulder field (continuing around the lake counter clockwise) you can climb the hillside next to the boulder field, and when you are high enough, climb carefully out onto the boulders and shoot Bear Lake framed by the aspen. This photo is best taken early on the morning or late in the afternoon. 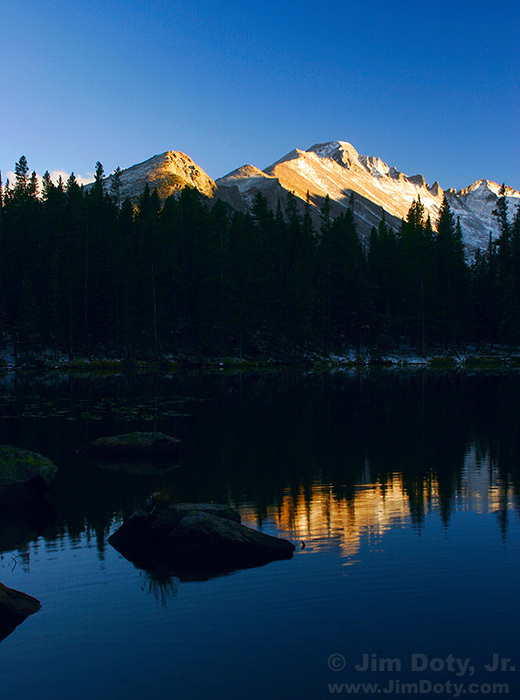 Without climbing up into the boulders, you can also photograph Long’s Peak from down by the lake. Look for a large boulder of a bunch of reeds to add interest to the foreground. You can hike on around Bear Lake to the south side and (if it is a relatively calm day) photograph the aspen and boulders reflected in the lake. 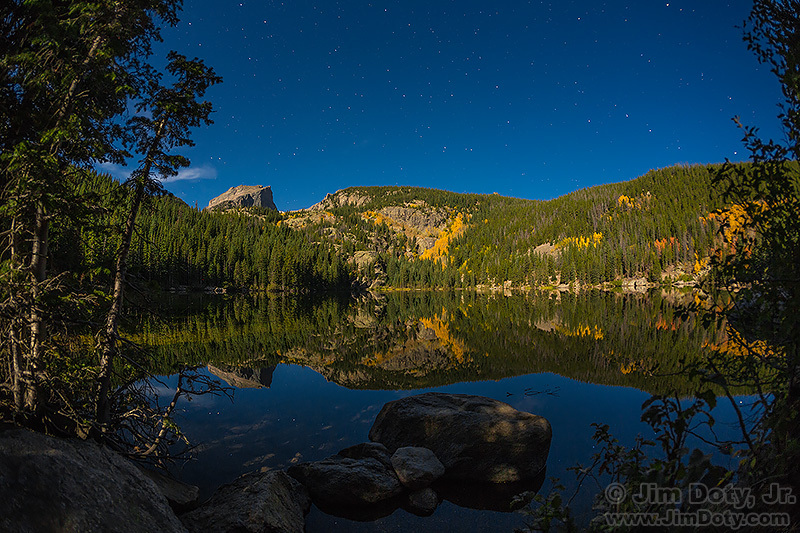 Bear Lake, Hallett Peak, and Flattop Mountain in the Moonlight. September 26, 2015. 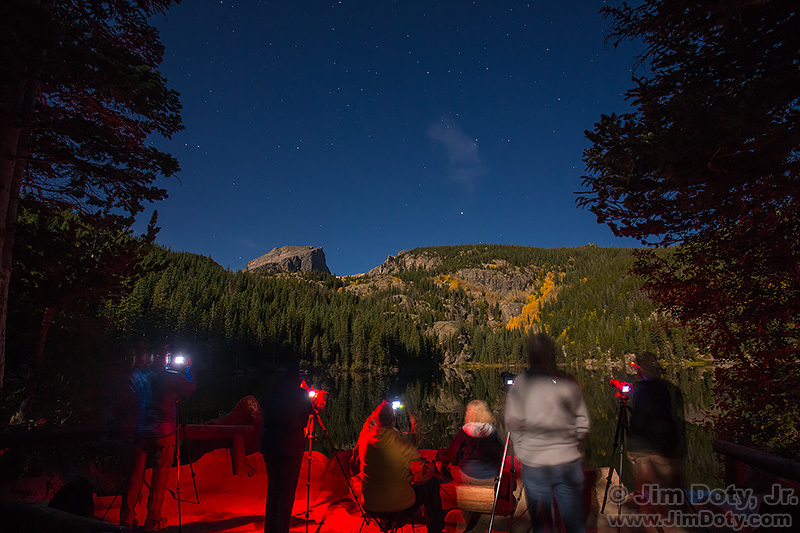 If you are at Bear Lake around the full moon don’t miss the opportunity to shoot by moonlight. Long’s Peak and Aspen on the trail to Nymph Lake. Rocky Mountain National Park, Colorado. September 26, 2003. As you finish your hike around Bear Lake you will come to the trailhead for Nymph, Dream, and Emerald Lakes. If you like to hike and don’t mind the elevation gain, they are worth the trip. You can do one, two, or all three lakes. All three lakes are evergreen lakes so they are not classic aspen locations, but they are still worth the hike. There are some nice aspen views along the trail to the lakes. Long’s Peak and Nymph Lake at Sunset, Rocky Mountain National Park, Colorado. October 5, 2005. It is 0.5 miles to Nymph Lake with an elevation gain of 230 feet. It is another 0.6 miles to Dream Lake with an additional elevation gain of 207 feet. 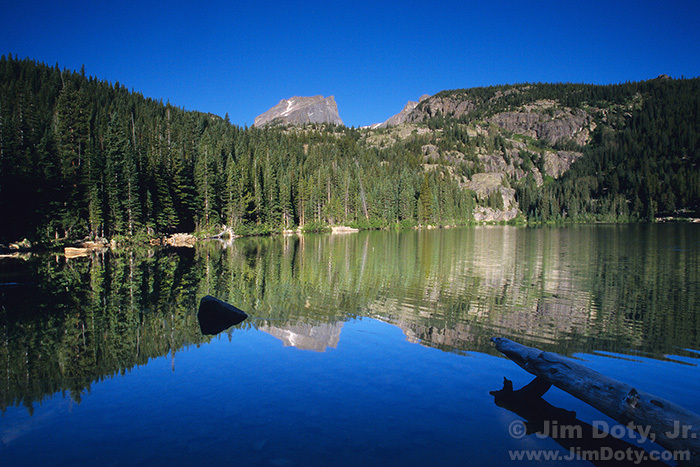 Emerald Lake is another 0.7 miles and an elevation gain of an additional 178 feet. If you do all three lakes you will have a total elevation gain of 615 feet and a round tip of 3.6 miles. More information on this trail. The Park has several fine overlooks with areas to park. Two of them are near Deer Ridge Junction. Upper Beaver Meadows and Longs Peak. Rocky Mountain National Park, Colorado. October 29, 2012. Southeast of Deer Ridge Junction on US 36 as you are headed south for Beaver Meadows, there is an overlook near a large and tall outcropping of boulders with an interesting, bent, gnarly tree. 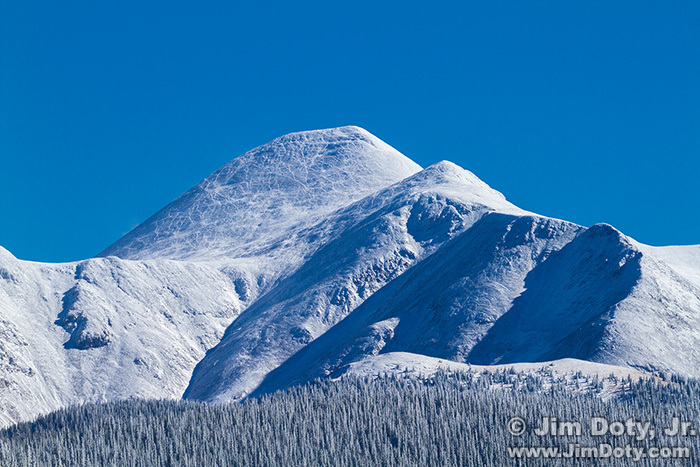 You can include the tree in your composition as you shoot looking south toward Long’s Peak. Horseshoe Park, Mt. Chapin, Mt. Chiquita, and Ypsilon Mountain. Rocky Mountain National Park, Colorado. October 29, 2012. Northwest of Deer Ridge Junction as you drive toward Horseshoe Park there is a parking area with a large outcropping of somewhat level boulders. You can climb up on these boulders and use them in the foreground as you shoot north or west over Horseshoe Park toward the mountains. Many Parks Curve and Rainbow Curve on Trail Ridge Road are nice overlooks. They accessible in the fall provided the road hasn’t been closed by a heavy overnight snowfall. Be sure and stop at the Beaver Ponds west of Deer Ridge Junction on U.S. 34/Trail Ridge Road. 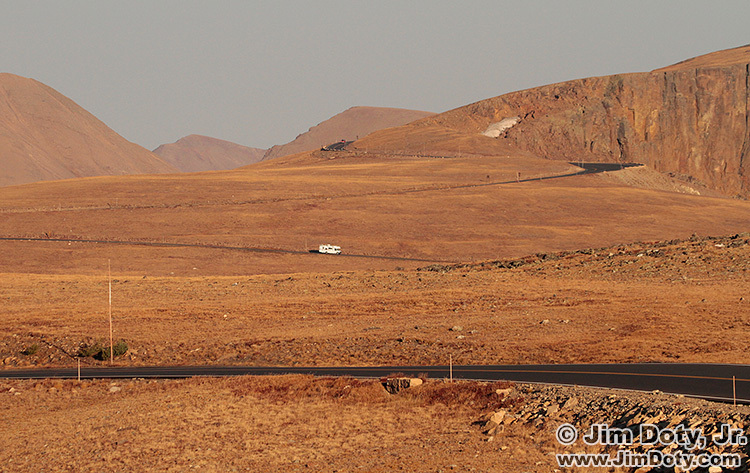 An RV on the winding loops of Trail Ridge Road. Rocky Mountain National Park, Colorado, October 4, 2010. 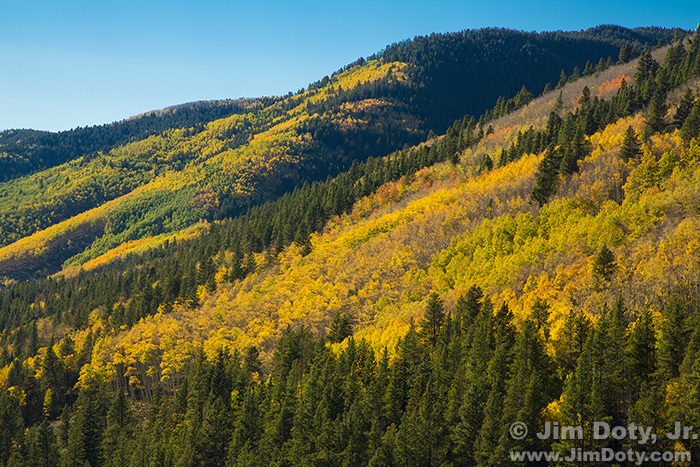 Most people don’t think of Trail RidgeRoad as a fall color location because there are no trees, hence, no aspen. The flowers are gone, the low lying vegetation turns brown, and most of the elk have left. Pika and marmots are mostly hiding out for the winter. It is not everyone’s cup of tea. But if you love the austerity of the alpine tundra, Trail Ridge Road in the fall has its charms. Rock Cut, Trail Ridge Road. Rocky Mountain National Park, Colorado. October 4, 2010. Sunset from Rock Cut, Trail Ridge Road, Rocky Mountain National Park, Colorado. July 31, 2007. 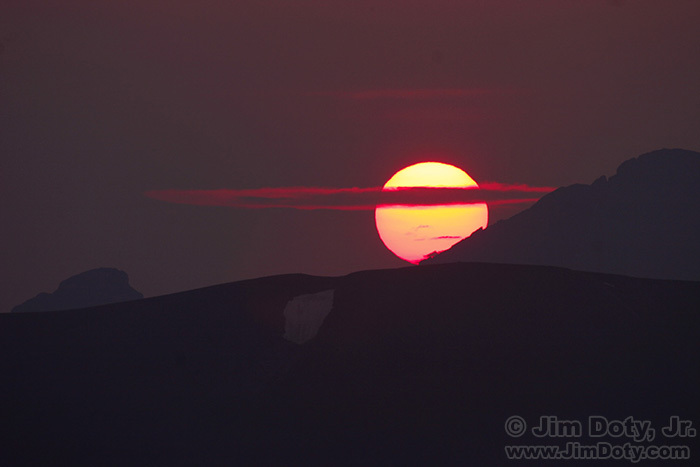 Don’t forget to hang around for sunset which can be quite spectacular up on Trail Ridge Road. While you are at it, you should always experiment with a variety of exposures when shooting a sunset. You could easily spend 2 or 3 days exploring the above locations, not to mention plenty of other interesting places in the Park. In fact, if it weren’t for the lure of the San Juan mountains, you could spend a week or more wandering and hiking in Rocky. As you may have guessed, Rocky Mountain National Park is one of my favorite places on the planet. You will need one or two days to drive from Estes Park to Montrose Colorado, depending on any side trips you might take. 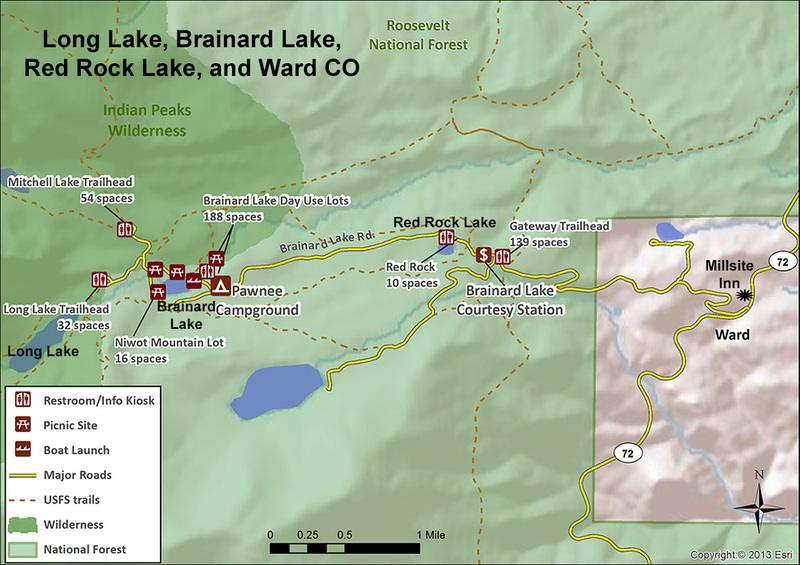 If you didn’t have time to take the Peak to Peak Byway on your arrival day, I highly recommend you stop at Brainard and Red Rock Lakes (near Ward) on your way south to Denver and Montrose. 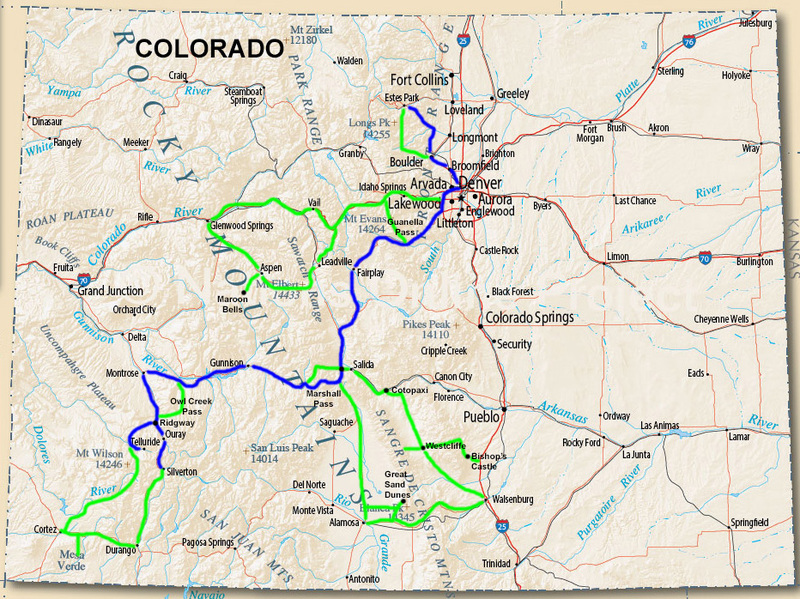 When you reach Denver, take I-76, I-70 and CO 470 to bypass most of Denver to get to U.S. 285. Take U.S. 285 south all the way to Poncha Springs, Colorado. Guanella Pass runs north from Grant, Colorado to Georgetown. There are some nice aspen groves on the south side of the pass, and more as you cross over the pass and head down toward Georgetown. I generally don’t drive more than a mile or two past the top of the pass and then head back south to Grant. This side trip will take from 15 minutes to a half day or more depending on how far north you go and how many pictures you take. It is 24 miles from Grant to Georgetown and the driving time is one hour. The actual driving time to the top of the pass is 30 minutes. At the top of the pass you (11,670 feet) are above timberline with nice views of Mt. Bierstadt and Mt. Evans to the south, a pair of Colorado’s Fourteeners. 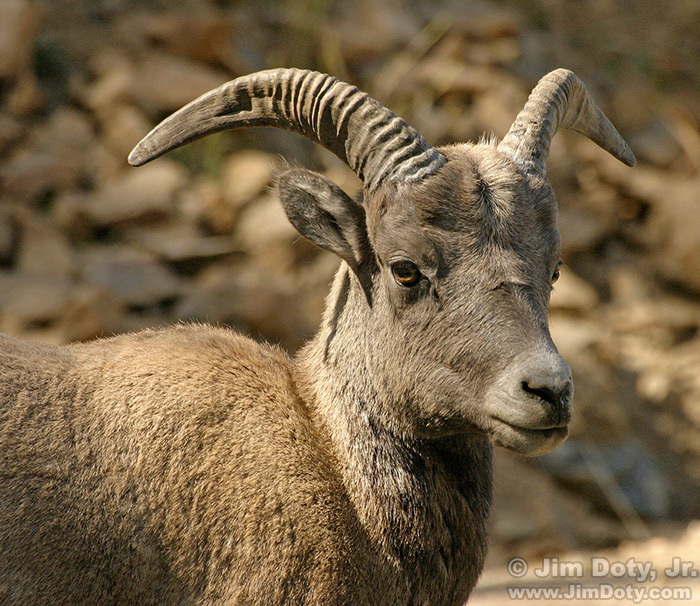 Bighorn sheep, Guanella Pass, Colorado. September 29, 2003. You could drive just a few miles up the road, photograph aspen, and head back to U.S. 285 in 15 – 30 minutes. Or you could drive to the top of the pass and a mile down the other side, then turn around and come back in an hour or two, allowing for plenty of photo time. If you drive all the way to Georgetown and back it will take a half day (more if you get side tracked by the fascinating architecture and/or the railroad loop in this wonderful mountain town). 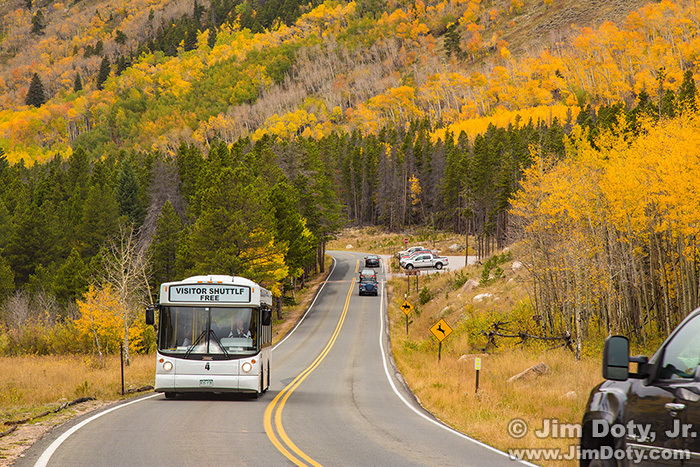 Guanella Pass is an official Colorado Scenic Byway (links below). An hour out of Denver you will come to Kenosha Pass. 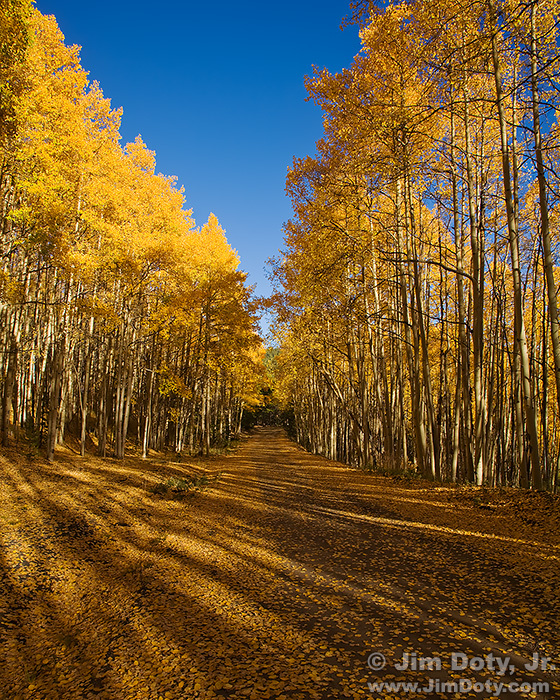 Stop at the campground road and check out the really nice stand of aspen on the hillside south of the road. As you leave the Kenosha Pass and go around the curve you will drop down into South Park, a huge level valley between the mountains. The curve is a great location to take a picture of South Park but you will have to park your vehicle before the curve and walk to the curve. Stay outside the guardrails and watch for traffic. Twenty minutes from Kenosha Pass you will come to Fairplay, the small town that inspired the TV show South Park. It is worth a few minutes to drive into town on the main road and check things out. Millonzi’s Restaurant in Fairplay is very good. Who would think a restaurant with a menu this fancy would be in Fairplay Colorado? Mt. Princeton, Collegiate Peaks, Colorado. October 7, 2007. As you continue south on U.S. 285 you will turn right to join U.S. 24 and head west up and out of South Park. The magnificent Collegiate Peaks will come into view. About a mile before you get all the way down into the valley, turn off at the picnic on the right and check out the panoramic view. Mt. Antero and Mt. Princeton’s Chalk Cliffs in the moonlight. Collegiate Peaks, Colorado. October 27, 2012. If your travel schedule is different than the one I outline here and you happen to drive by the Collegiate Peaks on a moonlit night, turn right (west) on Chalk Creek Drive (County Road 162) and head for Mt. Princeton Hot Springs. As you approach the resort area, Mt. Antero and Mt. Princeton’s Chalk Cliffs will be directly in front of you and they make a nice photo in the moonlight. U.S. 285 will take you south to Poncha Springs. If you spent a lot of time exploring during the day and are ready to stop for the night I recommend the Woodland Motel in Salida. Mimi’s Cafe at U.S. 50 and U.S. 285 in Poncha Springs serves Asian and American Food (we tried American and it was good) and there is a Thai Mini Cafe next door which I haven’t tried yet. 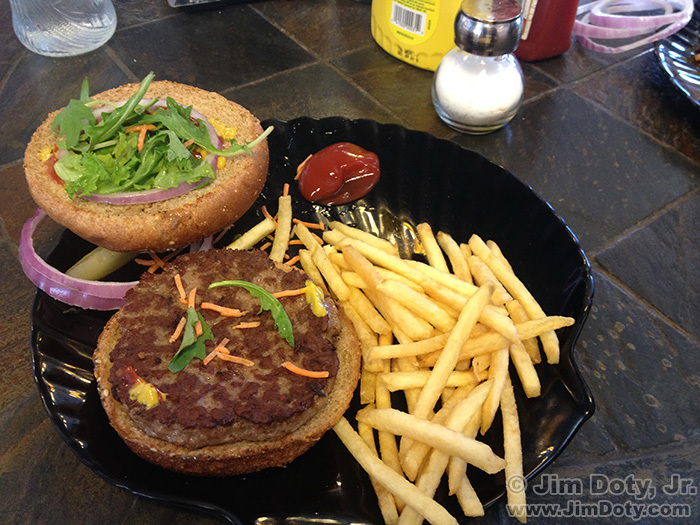 Lunch at A Mimi’s Cafe, Poncha Springs, Colorado. October 2, 2014. 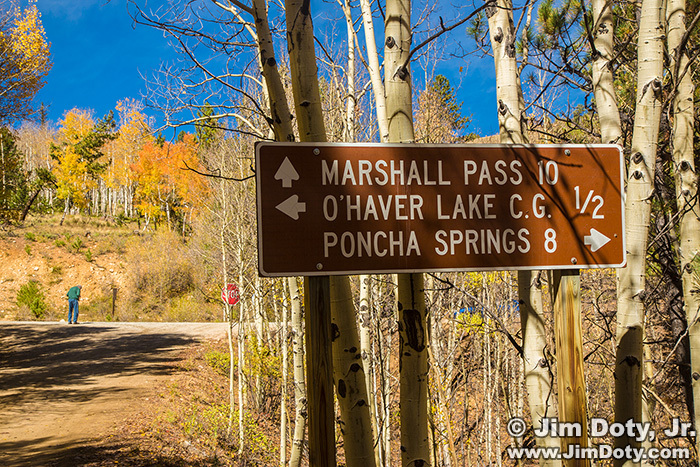 At Poncha Springs you have a choice between going west on U.S. 50 over Monarch Pass to Sargents Colorado, or going south and taking the dirt road over Marshall Pass to Sargents Colorado. As long as the weather isn’t bad, I highly recommend taking the beautiful scenic drive over Marshall Pass. It is one of my favorite drives in the whole state and is largely unknown to most photographers, leaf peepers and other tourists. Marshall Pass Road. 30 miles from U.S. 285 to Sargents, Colorado. 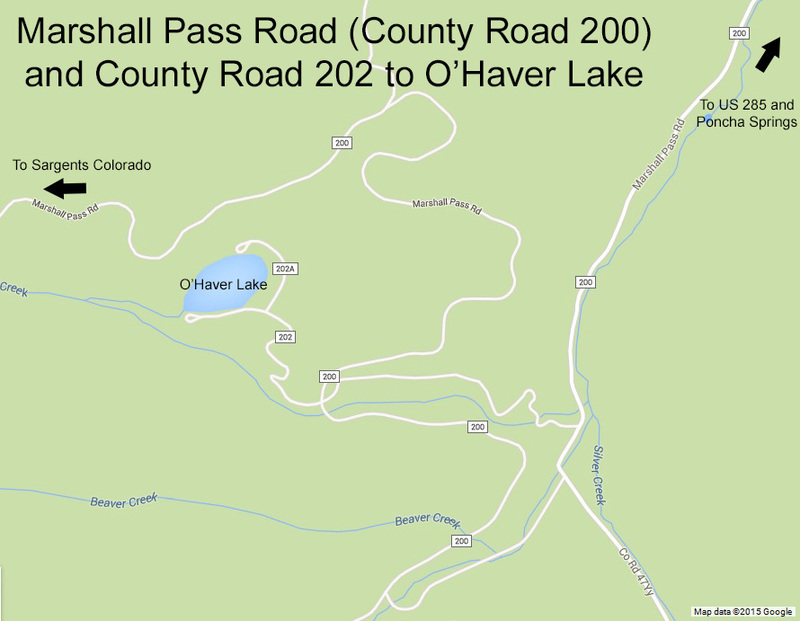 To get to Marshall Pass Road, from Poncha Springs drive south about 5 miles on U.S. 285 and turn right on the road to O’Haver Lake and Marshall Pass (County Road 200). From U.S. 285 to Sargents the whole Marshall Pass Road is about 30 miles. Follow the road toward O’Haver Lake and Marshall Pass. Aspen on the road to O’Haver Lake. Colorado. October 2, 2014. O’Haver Lake and Marshall Pass Road, Colorado. Click to see a larger version. After a couple of miles you will come to an intersection that gives you a choice between a side trip to O’Haver Lake and continuing on Marshall Pass Road. I recommend you take the 1/2 mile road up to O’Haver Lake before continuing on over Marshall Pass. O’Haver Lake and Marshall Pass Sign. Chaffee County Roads 200 and 202, Colorado. This view is looking north. When you approach this intersection you will be coming from the east, like the blue car behind the trees. October 2, 2014. O’Haver Lake and Mt. Ouray, Colorado. September 28, 2010. O’Haver Lake is a charming location that sits between three mountain passes with a view to Mt. Ouray off to the west. Thanks to the uniqueness of the location, O’Haver Lake is less chilly at night than other campgrounds in the area. This is a great location if you like to camp, eat a picnic lunch, fish, take photographs, or just hang out and enjoy the view. 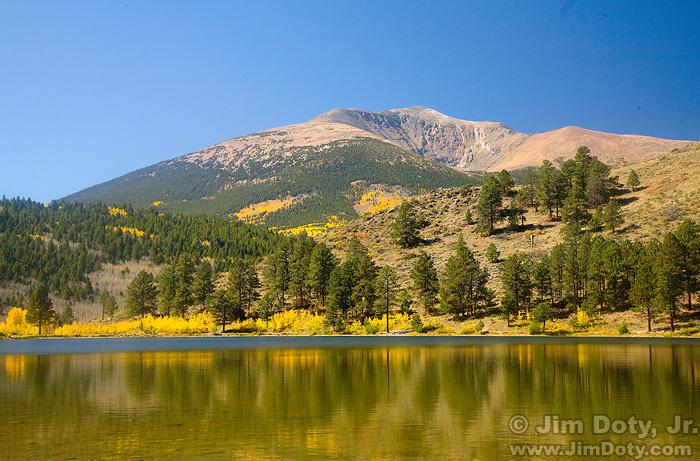 When I was growing up in Colorado we would camp at O’Haver Lake several times every summer. Twenty years later I would take my own family to O’Haver Lake. O’Haver Lake and Mt. Ouray, Colorado. October 2, 2014. Aspen and Mt. Ouray from O’Haver Lake, Colorado. October 2, 2014. You can shoot across the lake at Mt. 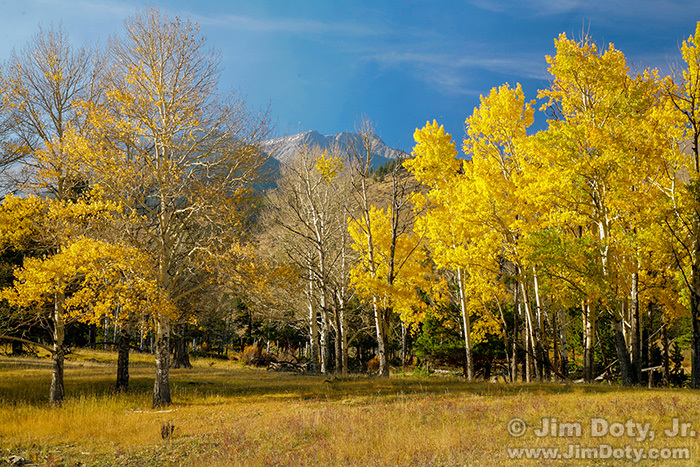 Ouray, or go to one of the aspen groves and shoot Mt. Ouray between the aspen. 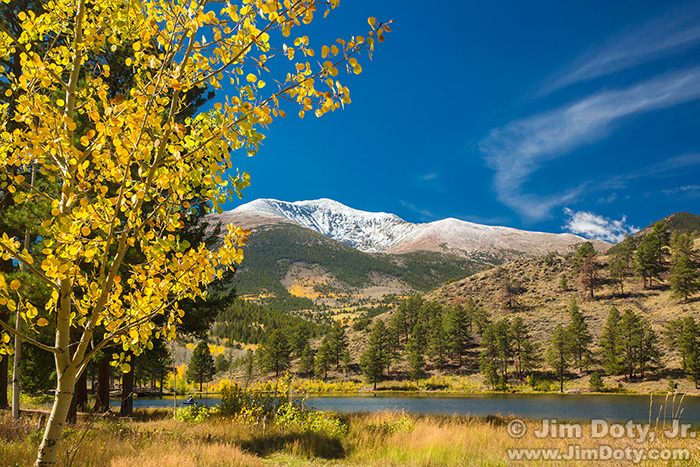 Aspen and Porphyry Peak from O’Haver Lake, Colorado. September 30, 1986. There is a hill behind the camping area on the east side of the lake. 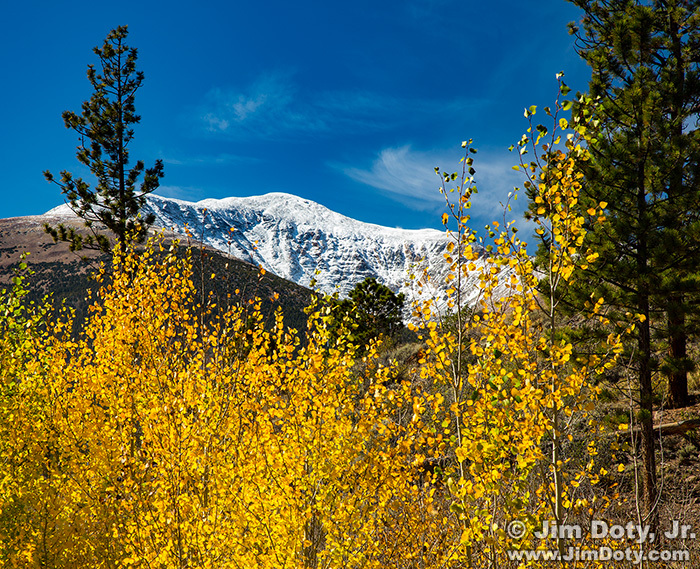 If you climb the lower (southern) section of the hill you can photograph Porphyry Peak with aspen and evergreens. 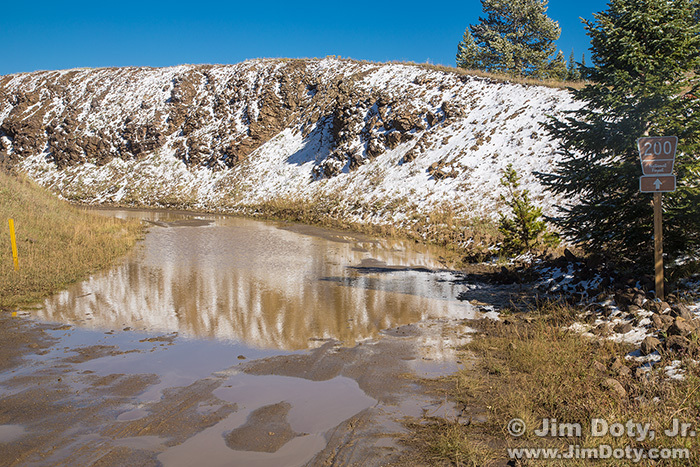 After taking pictures at O’Haver Lake, drive back to Marshall Pass Road. Marshall Pass heads north, turns west and winds around a hillside up above O’Haver Lake (get out and take a look) and continues west toward Mt. Ouray. Aspen, Porphyry Peak, and the Sangre de Cristo Mountains from Marshall Pass Road, Colorado. September 25, 1990. As Marshall Pass Road climbs above O’Haver Lake, you get a lovely view of aspen mixed with evergreens, Porphyry Peak, and some of the Sangre De Cristo Mountains to the southeast. 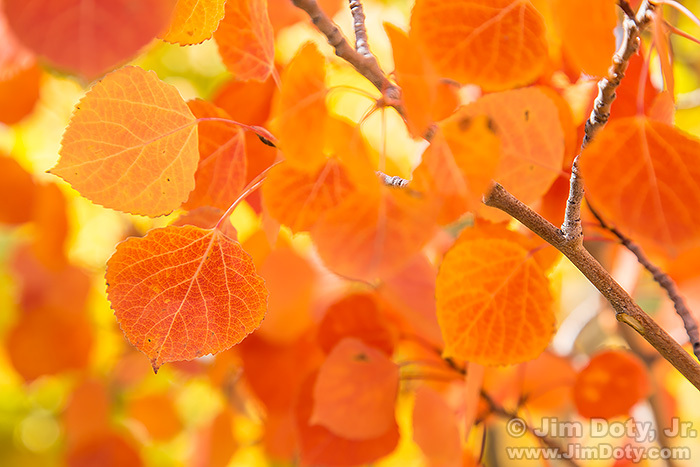 Aspen Leaves, Marshall Pass, Colorado. September 29, 2005. Going up the east side of Marshall Pass you have one aspen grove after another scattered all along the road. 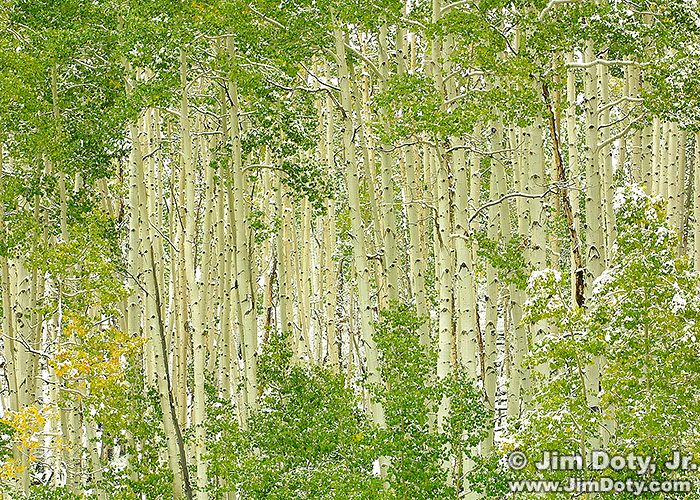 Aspen Grove, Marshall Pass, Colorado. September 28, 2010. 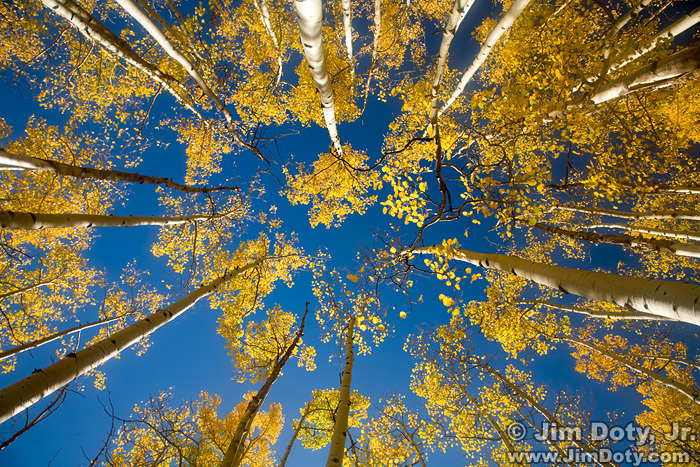 Don’t forget to get out in the middle of an aspen grove, lay down on the ground and shoot straight up with a wide angle lens. A polarizing filter is your friend. Muddy road at the top of Marshall Pass, Colorado. October 2, 2014. At the top of the pass you cross over the Continental Divide on Mt. Ouray’s south flank. If it has snowed and melted recently, it can get a bit messy at the top of the pass. Mt. Antora and Frost Covered Trees from Marshall Pass, Colorado. October 2, 2014. It can get cold at night at 10,842 feet. At Marshall Pass the tops of the trees were tipped with frost from the overnight cold. The trees at higher elevations on Mt. Antora to the south were totally covered with a heavy coating of frost. A few miles below the pass the temperature was 42 degrees, and in Sargents it was 51. At the top of the pass I bet it wasn’t much above freezing at 3 in the afternoon. Mount Ouray, Marshall Pass Colorado. October 2, 2014. Aspen, Marshall Pass, Colorado. September 28, 2010. Going down the west side of Marshall Pass toward Sargents the best aspen groves are in the first five miles. Aspen, Marshall Pass, Colorado. October 2, 2014. Red-Tipped Aspen. Marshall Pass Road, Colorado. October 2, 2014. 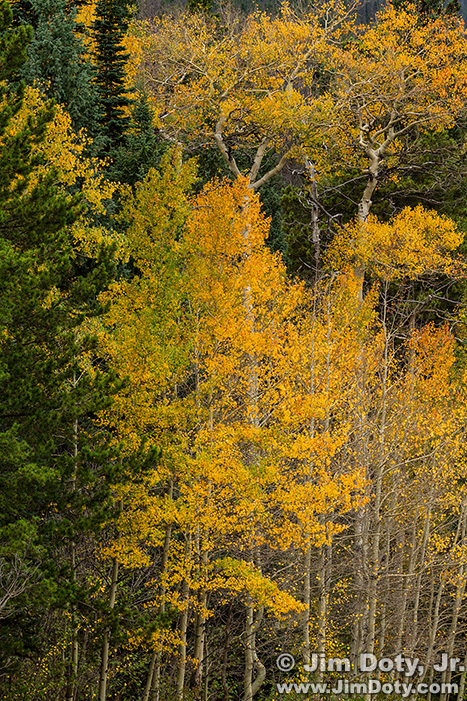 On the west side of Marshall Pass as the aspen trees begin to thin out, there is one very fine grove on the south side of the road where the aspen are tipped with red leaves. Marshall Pass Road, Colorado. September 28, 2010. The farther west you go the less aspen you have and you get rolling hills and scrub bushes with very few trees. Tomichi Creek Trading Post, Sargents, Colorado. October 2, 2014. At Sargents Colorado you rejoin U.S. 50. 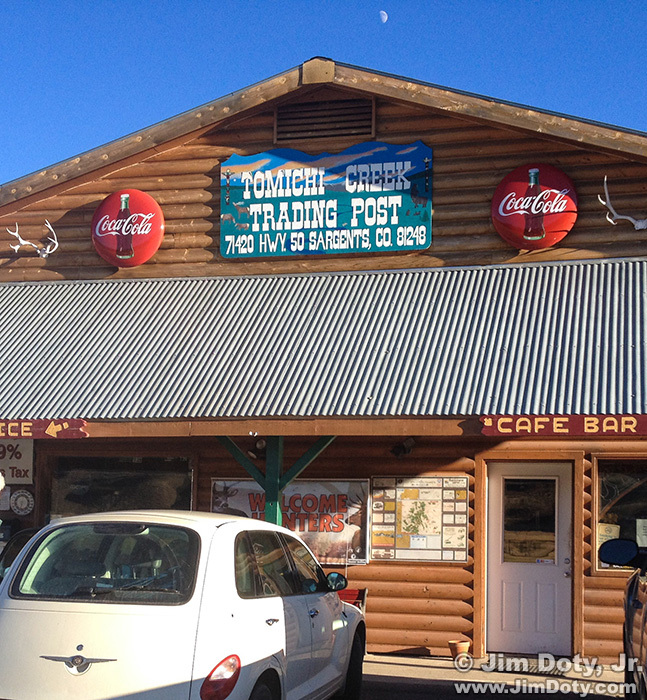 Your reward at the end of a beautiful drive is stop at the Tomichi Creek Trading Post to eat. I stop there almost every time – it has become a tradition. Be sure and wander around and look at the signs on the walls. 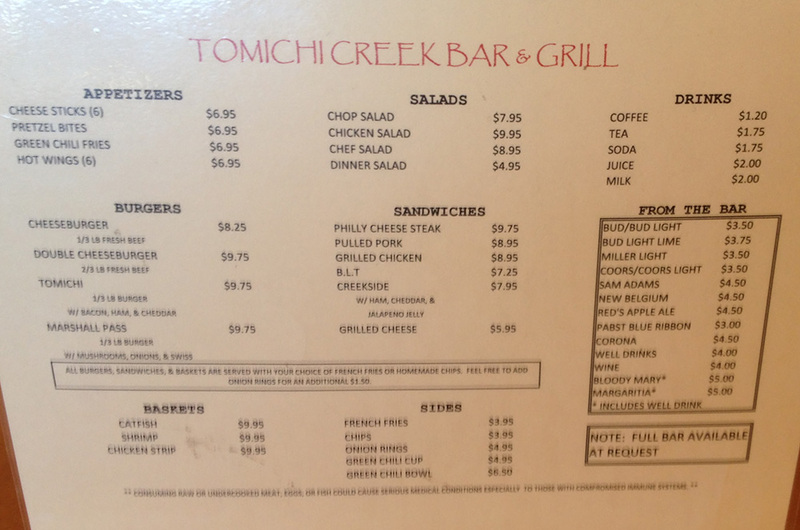 Tomichi Creek Bar and Grill, Sargents Colorado. October 2, 2014. From Sargents it is 96 miles to Montrose Colorado. I make Montrose my trip headquarters when exploring the San Juan mountains and I recommend staying at the Black Canyon Motel. It is on the north side of U.S. 50 on the east side of Montrose. Early, early get up and head west on U.S. 50 and turn south on U.S. 550 in downtown Montrose. The Sneffels Range from CO 62 west of Ridgway, Colorado. October 3, 2014. When you get to Ridgway Colorado, check your odometer and go east exactly 6 miles west on CO 62. Mt. Sneffels at Sunrise from CO-62 west of Ridgway Colorado. October 3, 2002. When you arrive you will be at one of the most photographed locations in all of Colorado. Look for the fence on the south side of the road (I left out the fence in the photo above but you can see it in the photo below), two fields with a line of trees cutting between the fields, rolling hills, and magnificent Mt. Sneffels. Small wonder that many of the best professional landscape photographers have photographed this scene, all of them standing somewhere along the very same 50 foot stretch of fence line. Sunrise is a great time to be at Sneffels with the sun to the left. Late afternoon and early evening also work well with the sun to the right. Mt. Sneffels and the Sneffels Range by Moonlight, Colorado. October 3, 2014. 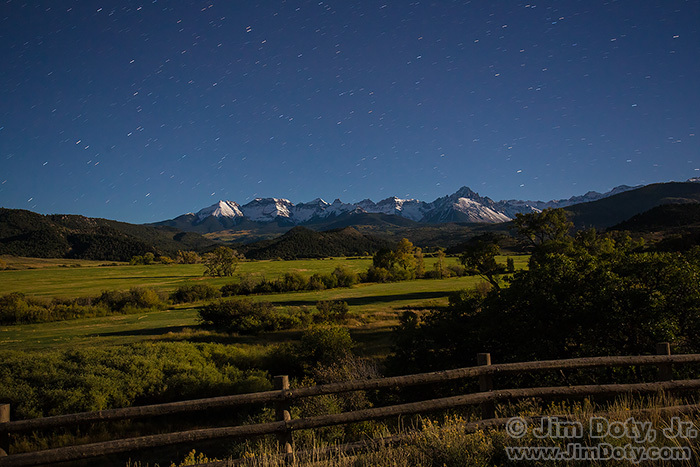 If there is enough moonlight this same spot is also a nice place to photograph the Sneffels Range at night. Mt. Sneffels and the Sneffels Range from County Road 7 (East Dallas Creek). Colorado. September 29, 2010. 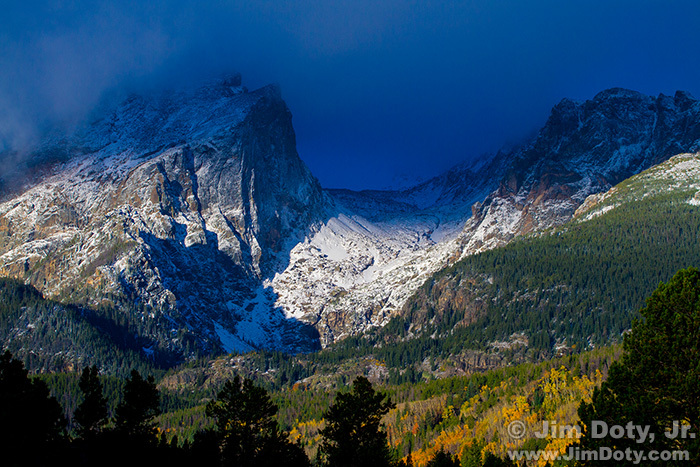 After photographing at Sneffels at sunrise, turn around and drive 2 miles back toward Ridgway (going east). Look for a sign that says County Road 7 (or East Dallas Creek) on the south side of the road. Drive 6.8 miles south on this dirt road and you will come to one of the most beautiful valleys in all of Colorado. Mt. Sneffels is again the star of the scene. You can take photos of Mt. Sneffels from anywhere along the next 0.8 miles of road. This is private ranch land so stay on the road. Do not walk down into the valley or climb the hill above the road. My favorite spots to photograph Mt. Sneffels are from where the valley first comes into view (photo immediately above), and 0.8 miles farther south near the cattle guard and fence (photo immediately below). My favorite time is early to mid morning. You can cross the cattle guard at the fence and follow the road farther south. Once you drive across the cattle guard you are on public land and you can wander off the road to take pictures. 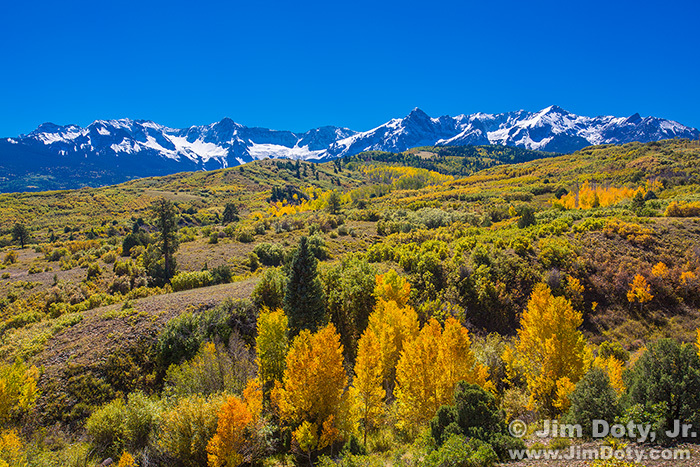 There are some nice intimate landscapes to be had as you drive south but Sneffels gets harder and harder to see. When you have soaked in the view and taken all the pictures you want, head back to CO 62 and go west. Sneffels Range from Dallas Divide. Colorado. October 3, 2014. Near Dallas Divide there is a large parking area where you get a panoramic view of the entire Sneffels Range. 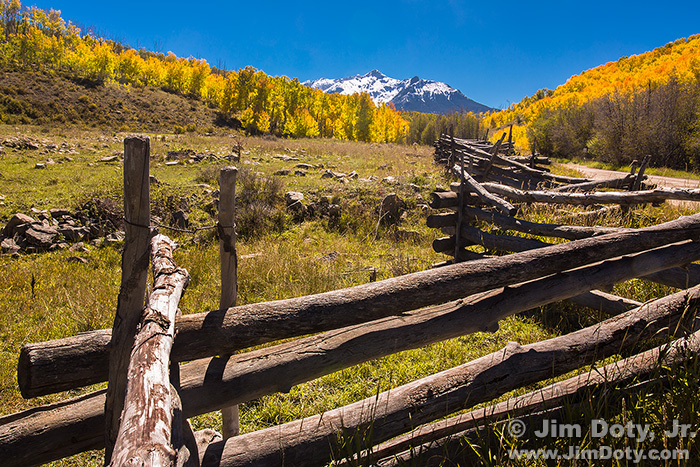 Old Fence and the Sneffels Range, Last Dollar Road, Colorado. October 3, 2014. From Dallas Divide go west to Last Dollar Road and turn left. At the intersection of CO-62 and Last Dollar Road you can take photos of an old wooden fence with the Sneffels Range in the background. The photos you see immediately above and immediately below were taken within a few hundred yards of each other. They were both photographed on October 3 in different years and illustrate the year to year variation in the timing of the color change. 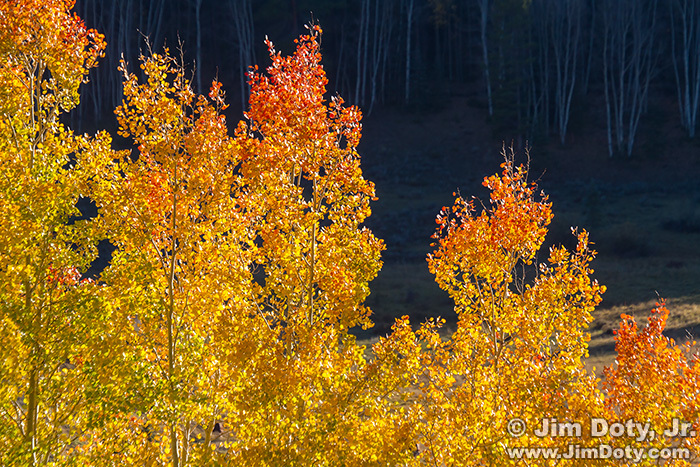 In the photo above the aspen along the north end of Last Dollar Road are at the peak of fall color. In the photo the below aspen along north end of Last Dollar Road have just started to turn. Snow Covered Aspen, Last Dollar Road, Colorado. October 3, 2002. There are some fine aspen groves along the first stretch of Last Dollar Road, but I would not drive south all the way to Telluride on Last Dollar Road unless you have a high clearance vehicle, preferably with 4 wheel drive. Much of the road is closed in the winter. Several scenes from the movie True Grit (1969) were filmed near Last Dollar Road (links below). 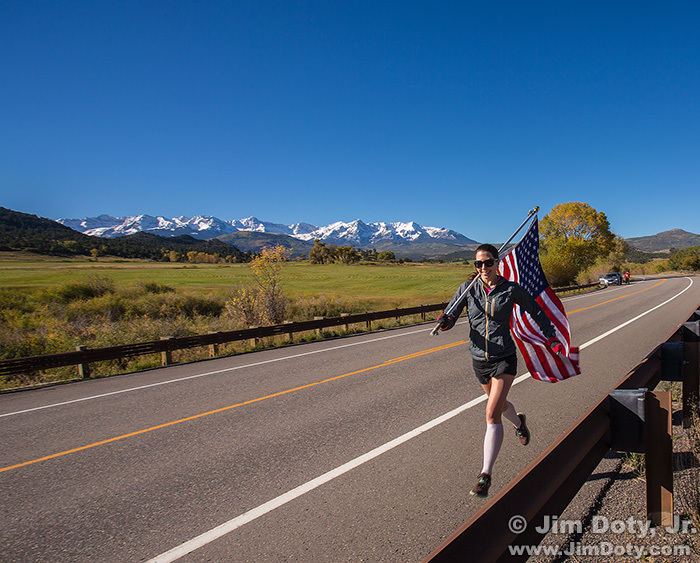 From Last Dollar Road go back north to CO 62, head west, then south on CO 145 to the charming town of Telluride. It is surrounded by steep mountains which make it one of the most spectacular scenic towns in the U.S. Wander the town and take pictures of the old buildings with the mountains as a back drop. The town was named for “Gold tellurides” (Google it), but some people like to say the town’s name is a short version for how far you had to ride a long time ago to get there (“to hell you ride”). From Telluride you can go back north on CO 145 and CO 62 to Ridgway. Stop in Ridgway at the park. The hanging scene from the movie True Grit with John Wayne was filmed in Ridgway’s Hartwell Park. The scene where Mattie confronts Marshall Rooster Cogburn after the hanging was also filmed in Ridgway. Wander around, take pictures, and do the tourist thing. There are links below for True Grit filming locations at Last Dollar Road, Ridgway, Ouray, and Owl Creek Pass. Check these out before your trip so you will know what to look for when you are on site. Both Sneffels locations, Dallas Divide, Last Dollar Road, Telluride, Ridgway and then back to Montrose will take pretty much a full day. Head south again to Ridgway and keep going south on U.S. 550 to Ouray, another charming mountain town. 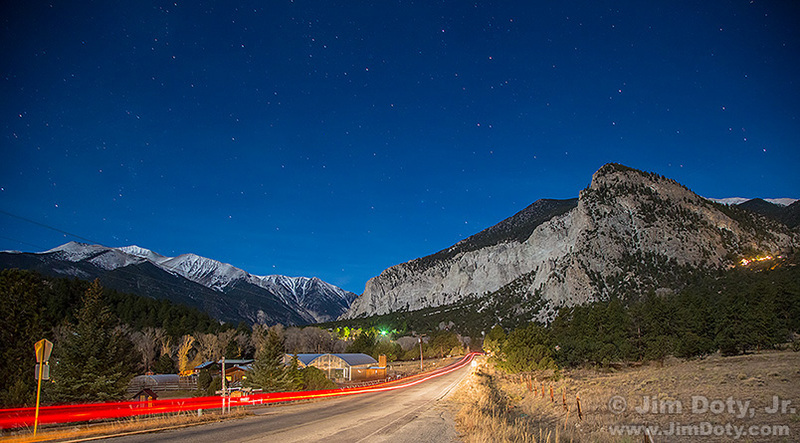 From Ouray south, the drive is quite exciting and the scenery stunning. You are on the Million Dollar Highway from Ouray to Silverton. It is a high mountain road with steep drop offs on the side of the road. Some people consider this a bare knuckle drive. If you get a few miles south of Ouray and decide this road is not for you (it happens), there are places to turn around and go back to Ouray. Some attribute the name of the highway to the million dollar views. Others attribute the name to the approximate cost per mile to build the road. There will be a lot of places to take pictures with wonderful views. You won’t need any location advice, the photo opportunities will jump right out at you. You will want to spend some time in Silverton. I usually turn around in Silverton and head back north to Montrose. The trip makes a nice half day to a full day of photography, depending on how far south you drive and how much time you spend taking pictures. 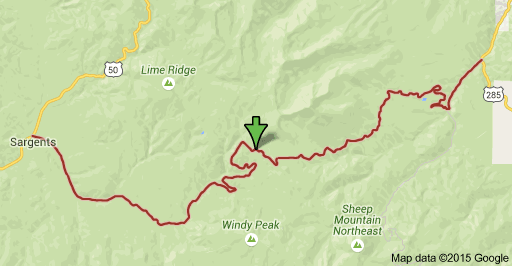 If you are back in Ridgway by 1 or 2 in the afternoon, consider going back to Montrose via Owl Creek Pass. Directions below. 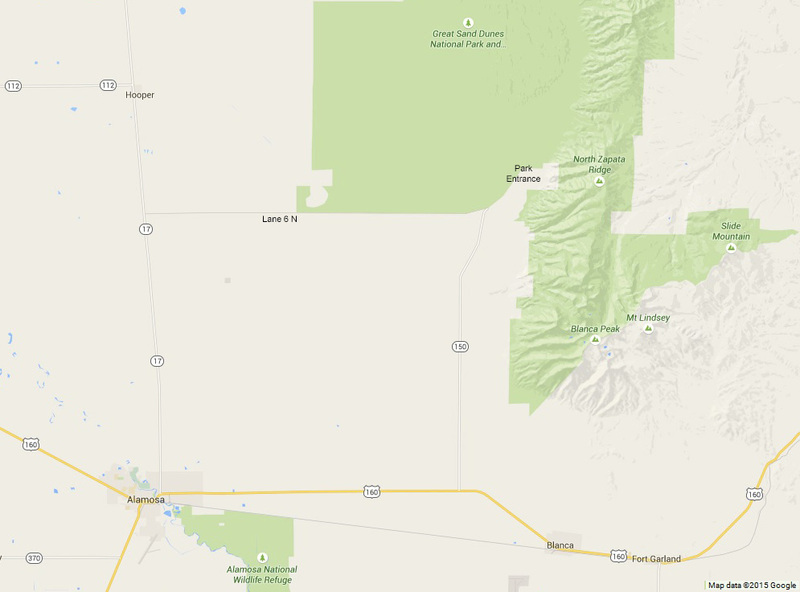 Another option is to drive on south to Durango and spend the night there or in Cortez. The next day you can drive west to see Mesa Verde National Park where you can easily spend a whole day. Depending on how long you are at Mesa Verde you can spend the night in Cortez or head back to Ridgway on CO 145 and CO-62 and then north to Montrose. This option will take you all the way around the San Juan Skyway from Ridgway south to Durango, west to Mesa Verde and Cortez, and northeast back to Ridgway. The San Juan Skyway is a National Scenic Byway and officially recognized as one of the most beautiful drives in the U.S. In my opinion it is one of the best of the best. 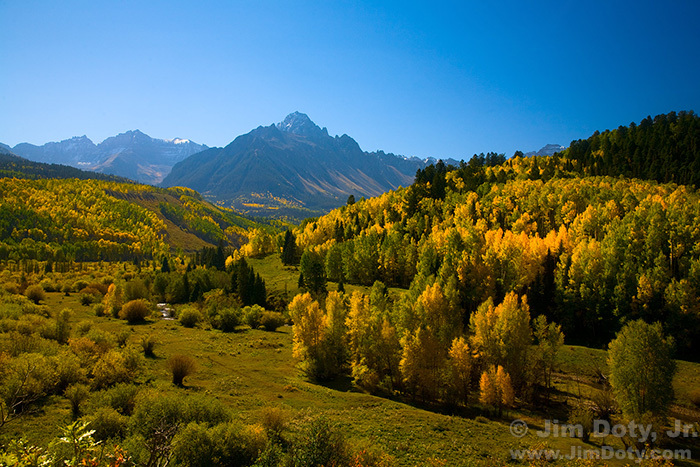 Owl Creek Pass from north of Ridgway to Cimarron Colorado. 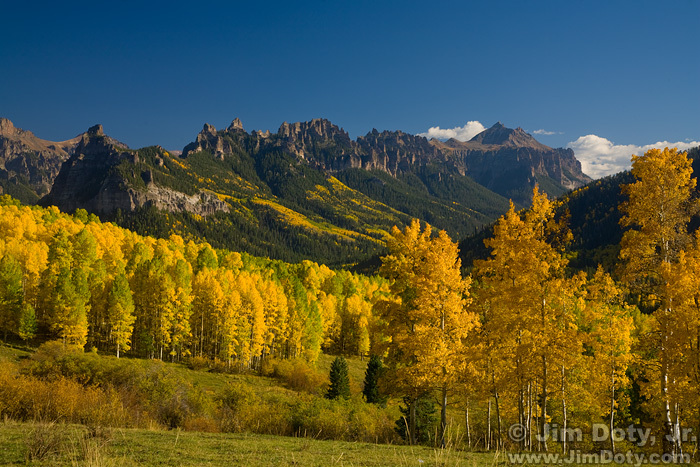 From just north of Ridgway Colorado, drive east on Owl Creek Pass Road. You will head east, cross over the high point of the pass (which isn’t very high) and drive north to Cimarron Colorado on U.S. 50. Along the way you will see some beautiful scenery. 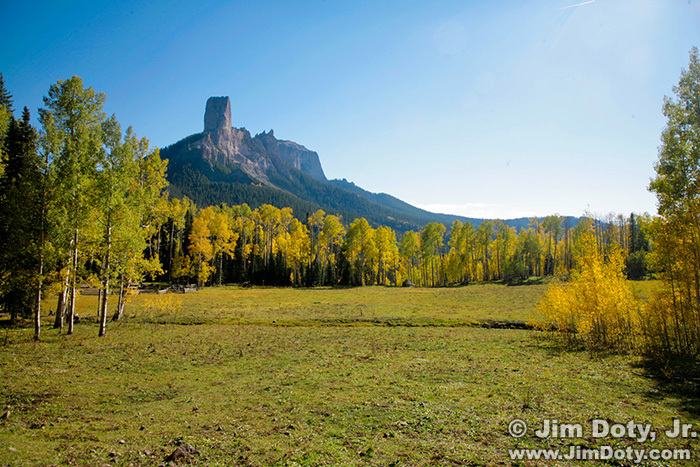 Deb’s Meadow and Chimney Rock, Owl Creek Pass, Colorado. September 29, 2010. 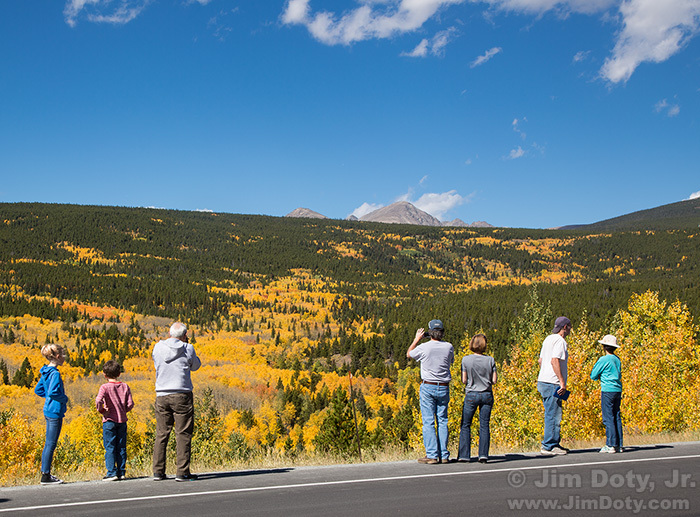 As you turn north near the top of Owl Creek Pass you will come to Deb’s Meadow on the left side of the road. This is where the famous gunfight scene in True Grit (1969) was filmed with John Wayne and Robert Duvall. There is a parking lot just off the road. On the edge of the meadow you can see the large boulder that was behind John Wayne in the scene where he is on the ground with his leg was trapped under his horse. Chimney Rock is in the background. It is a well known location and you will probably see several cars parked there and True Grit fans wandering the meadow. 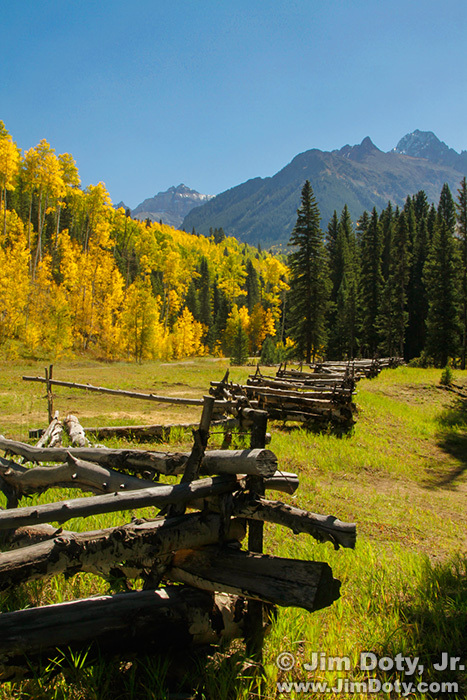 Other scenes from the movie True Grit were also filmed near Owl Creek Pass (links below). Owl Creek Pass, Courthouse Mountain, looking south from Silver Jack Reservoir, Colorado. September 29, 2010. As you make your way north you will come to Silver Jack Reservoir. South of the reservoir on the left side of the road there is a large parking area. That are lot of aspen and plenty of good photo opportunities. The best photos are taken looking south toward Courthouse Mountain and east toward the Pinnacles. The Pinnacles, Owl Creek Pass, looking east from Silver Jack Reservoir, Colorado. September 29, 2010. 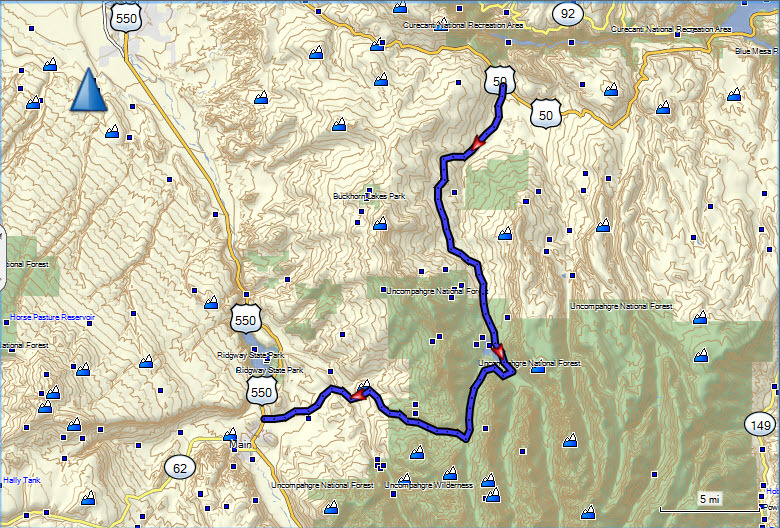 The total length of Owl Creek Pass is 45 miles. I spent a total of 3 1/2 hours driving the road and taking pictures (but I spend more time than most people). That does not include the time it takes to get from Montrose down to the beginning of Owl Creek Pass, or from Cimarron at the north end of the pass back to Montrose (19 miles). On your Ouray-Silverton day, depending on how much time you spend and how far south you decide to drive, you could do Owl Creek Pass on your way back north. Or if Owl Creek Pass is your last day in the San Juans, do Owl Creek Pass in the morning, and when you get to Cimarron you can just head east on U.S. 50 instead of going west back to Montrose. 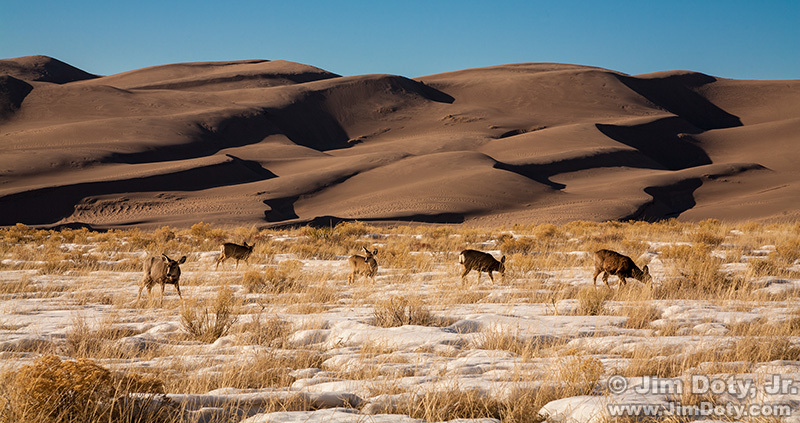 Deer, Great Sand Dunes National Park, Colorado. February 28, 2008. The Great Sand Dunes aren’t a fall color location but they are impressive with the tallest dunes in North America, rising 750 feet above the San Luis Valley floor, and a backdrop of the Sangre de Cristo Mountains rising to the east. The dunes exist because prevailing winds out of the west pile up sand at the base of the Sange de Cristos. I prefer being there at sunset when the dunes cast long shadows toward the mountains.You don’t get early morning sunlight with long shadows because the mountains block the sun until later in the morning. Alamosa Colorado and the Great Sand Dunes. Click to see a larger more readable map. From Montrose Colorado head east on U.S. 50, over Monarch Pass and turn south at Poncha Springs. It is a straight shot south on U.S. 285 and CO 17. Then go east at Lane 6 N which will take you to CO 150 and the entrance to the park. If you go south all the way to Durango on your Ouray-Silverton day and don’t intend to go back to Montrose, just go west on U.S. 160 to Alamosa and then CO 150 to the dunes. When you are done at the dunes, go back to U.S. 160 and head east to I-25 and then north to Denver. 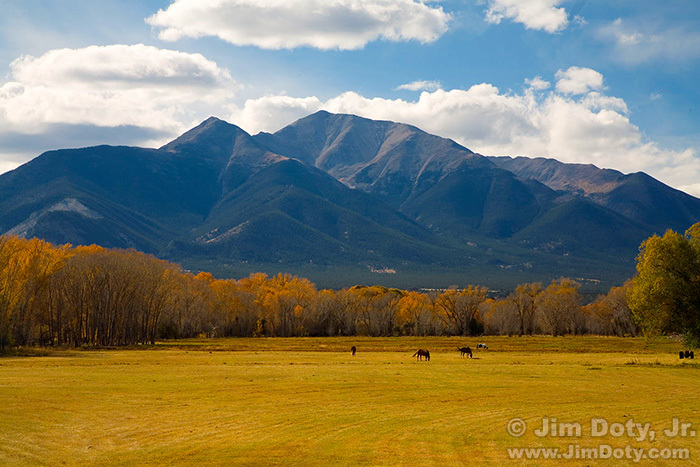 Or you can head for Westcliffe Colorado and see the other side of the Sangre de Cristo Mountains. Sangre de Cristo Mountains, Colorado. September 20, 1996. 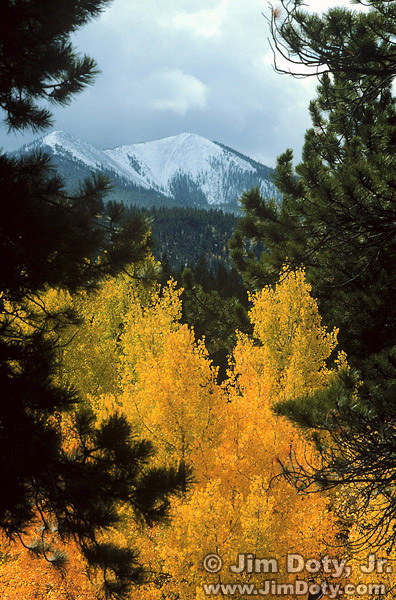 The Sange de Cristo Mountains are impressive, rising from a mostly level valley floor to as high as 14,000 feet. They look especially nice dusted on the top with snow and there are aspen to be seen in the right valleys. 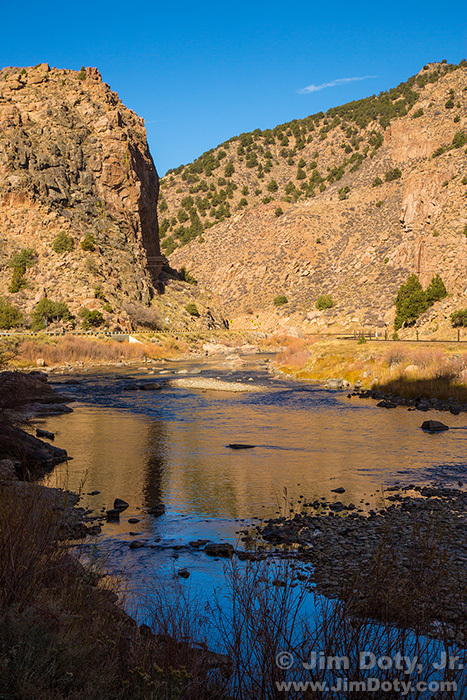 Arkansas River along U.S. 50 between Salida and Cotapaxi Colorado. October 28, 2012. If you are coming from Montrose go east on U.S. 50, through Salida and on to Cotopaxi Colorado. You will be following the Arkansas River between high canyon walls. Cotopaxi to Westcliffe, Colorado via County Road 1a and CO 69. Click to see a larger version. Turn south at Cotopaxi Colorado on County Road 1a to meet CO 69. 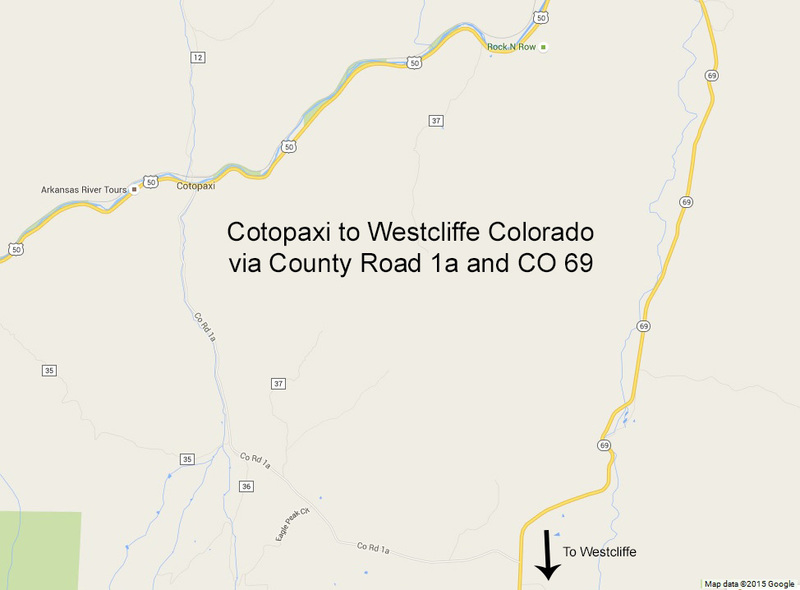 Go south on CO 69 to Westcliffe. 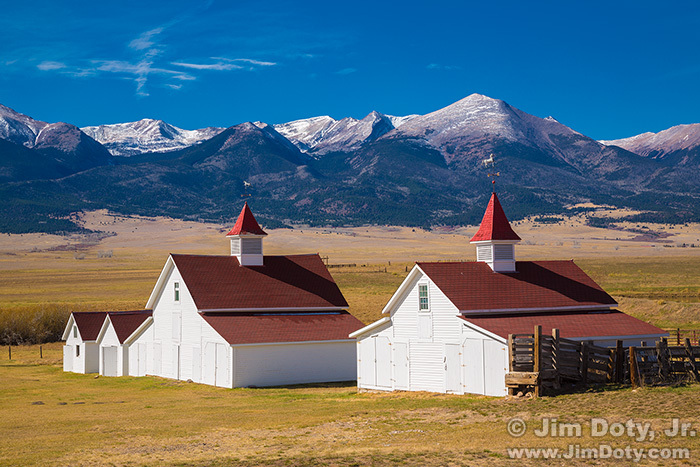 Part of the historic Beckwith Ranch and the Sangre de Cristo Mountains from CO 69 north of Westcliffe Colorado. October 28, 2012. You will find nice places all along CO 69 to stop and take pictures of the mountains, with cattle, rolling meadows, and old ranches in the foreground with the Sangre de Cristos in the background. 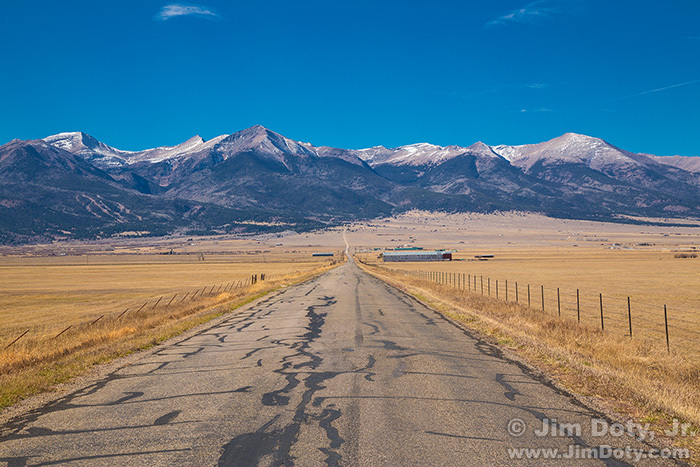 Alamosa to Westcliffe, Colorado via U.S. 160, I-25, and CO 69 with the County Road 520 short cut. Click to see a larger version. If you are coming from Alamosa and the Great Sand Dunes, take U.S. 160 east to Walsenburg, go north on I-25, then take CO 69 north to Westcliffe. Or if you are mildly adventurous, you can take County Road 520 as a shortcut from U.S. 160 to CO 69 at Badito. Westcliffe, Colorado and the Sangre de Cristo Mountains. October 28, 2012. 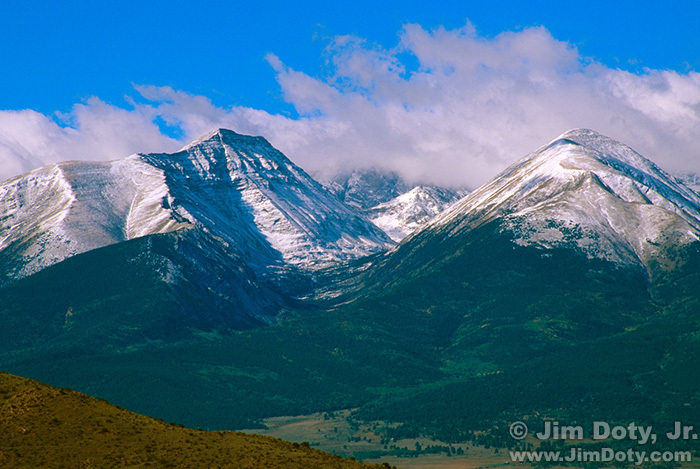 Westcliffe, Colorado is the hub of the valley and a charming little mountain town with wonderful views. Imagine living in Westcliffe and waking up every morning and looking west at the mountains. Park your car and wander around. 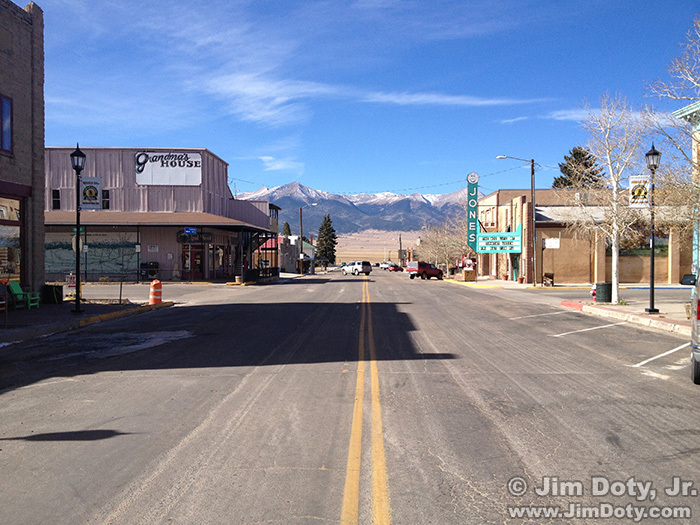 “Downtown” Westcliffe Colorado. Click to see a larger, more readable map. 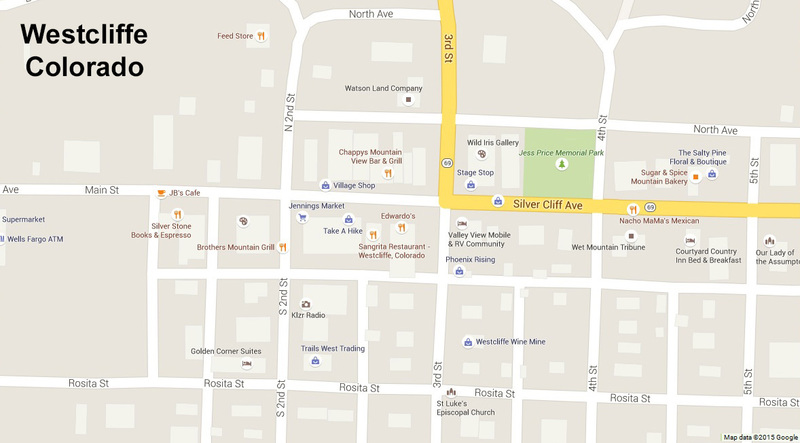 For a town with a population of 568, how is is possible that Westcliffe has over a dozen, highly-rated places to eat? Just pick one. 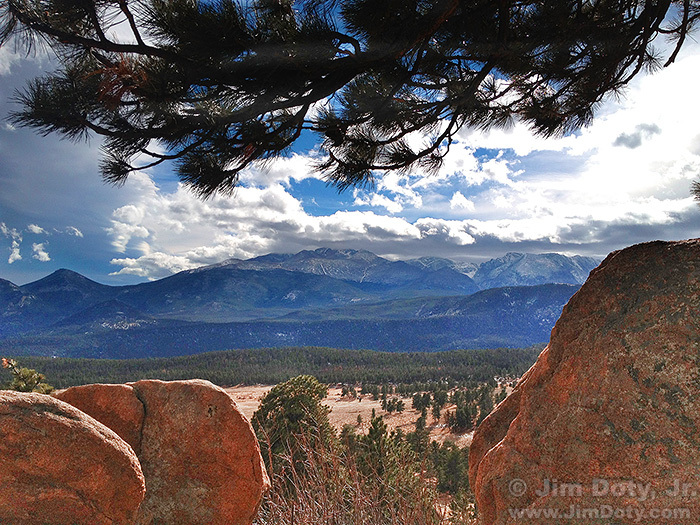 Sangre de Cristo Mountains and Hermit Road, Westcliffe, CO, October 28, 2012. 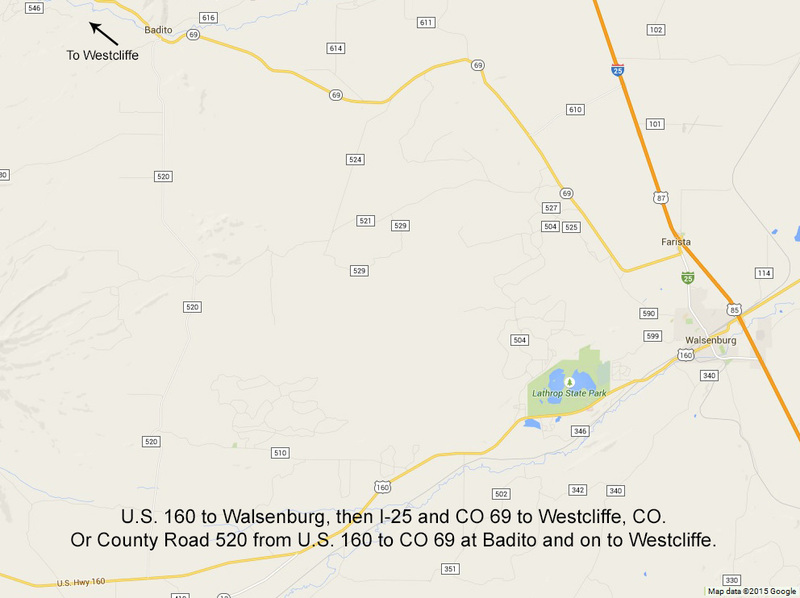 From Westcliffe you can go east on CO 96 to Pueblo and north on I-25 to return to Denver. Or you can take a short side trip to Bishop Castle which has nothing to do with fall but it is a fun place to visit. 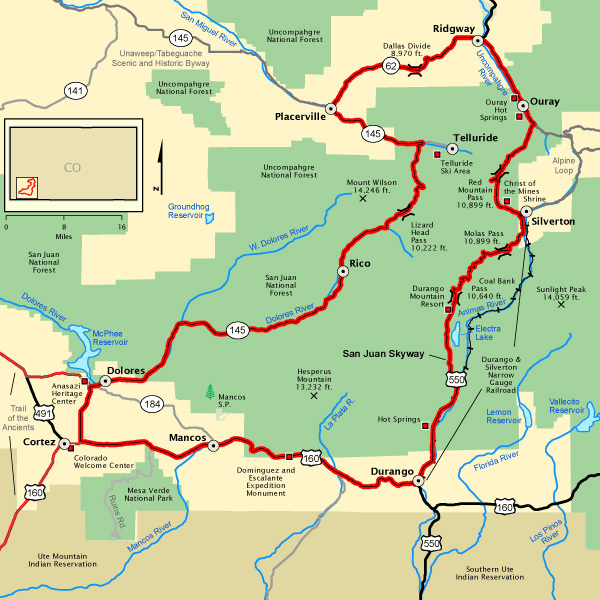 CO 96 going east from Westcliffe, and CO 165 going south and east past Bishop Castle to Rye and Colorado City is “Frontier Pathways”, an officially recognized Colorado Scenic Byway. Links below. Bishop Castle between Westcliffe, Rye, and Pueblo Colorado. Click to see a larger version. 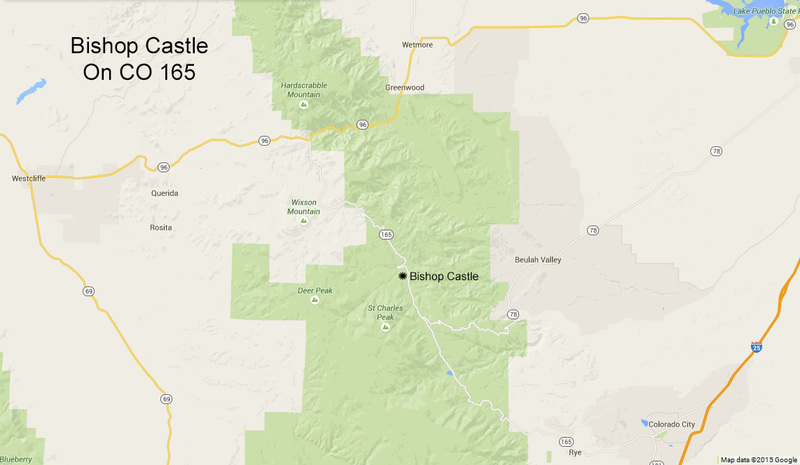 From Westcliffe go east on CO 96 and south on CO 165 to visit Bishop Castle. Bishop Castle, Colorado. One of the castle’s towers and two of the walkways between towers. You can climb up into the round globe at the top of the tower. February 29, 2008. Bishop Castle is essentially a one man private project to build a castle in the Rockies complete with a fire breathing dragon (the fire happens mostly on weekends) and several towers. 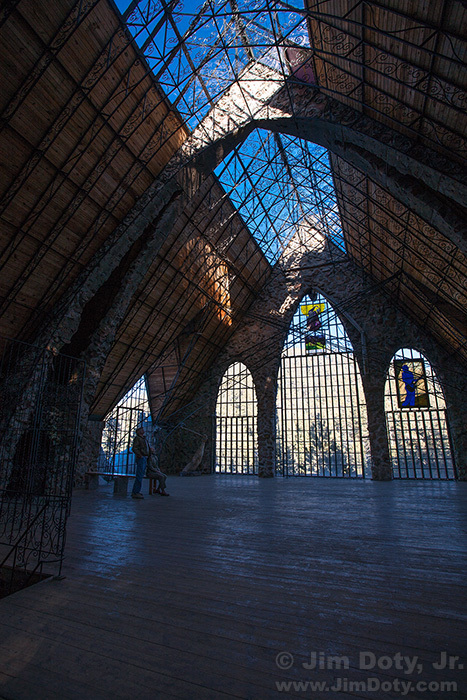 It is open to the public during day time hours and there is no charge to visit. More infomation is at the link below. Every time I go back to Bishop Castle something is different or bigger or taller. 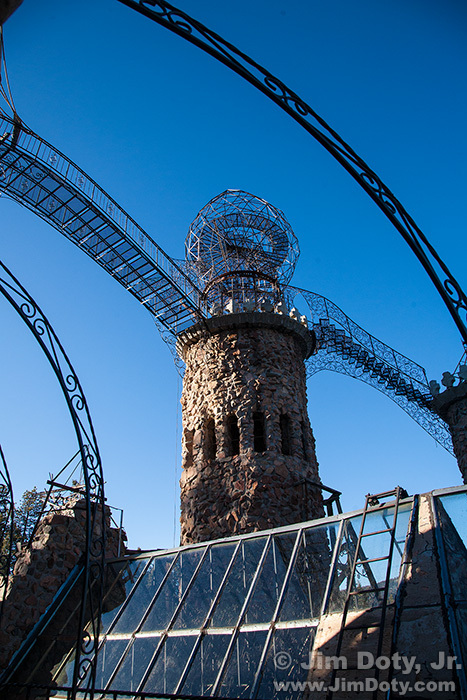 The main tower of the castle is currently 160 feet tall. Inside the Main Hall at Bishop Castle, Colorado. February 29, 2008. 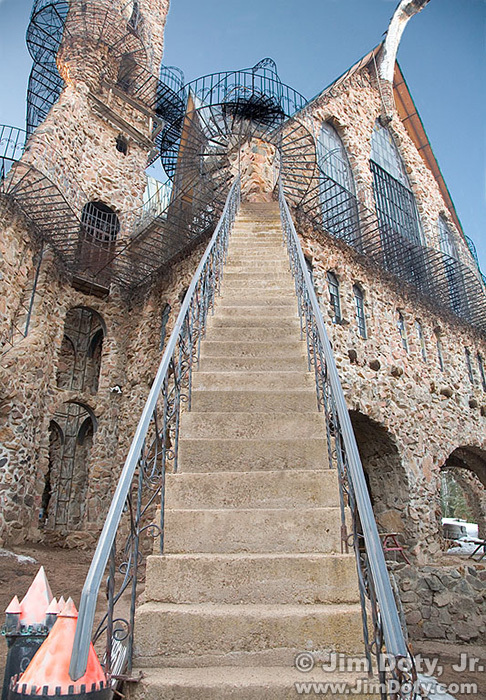 Bishop Castle, Colorado. February 29, 2008. From Bishop Castle you can take CO 165 north to CO 96 and east toward Pueblo. Or south on CO 165 to either CO 78 or I-25 to go to Pueblo and on north to Denver. You can’t do everything in one or two weeks and the following locations are out of the way from the trip recommended in this guide, but it is well worth the trip if you have the time and are looking for more optional locations. Kebler Pass runs from the Paonia reservoir (east of Somerset) on the west end to Crested Butte on the east end. 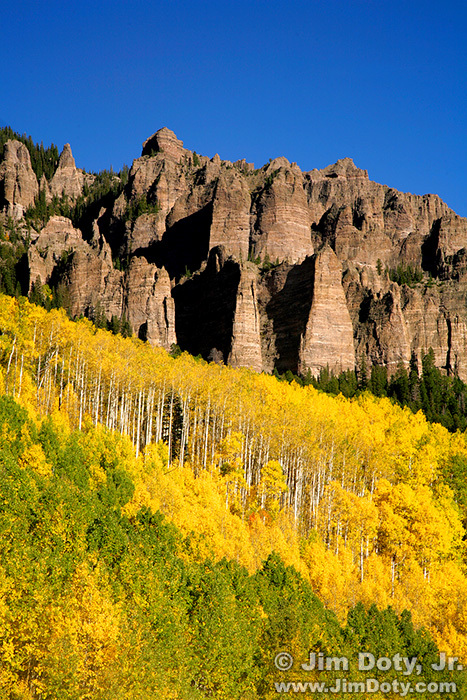 It is one of the best 30 mile drives in the whole state of Colorado and features the largest aspen forest in the world. Different stretches peak from the end of September through the first week of October. 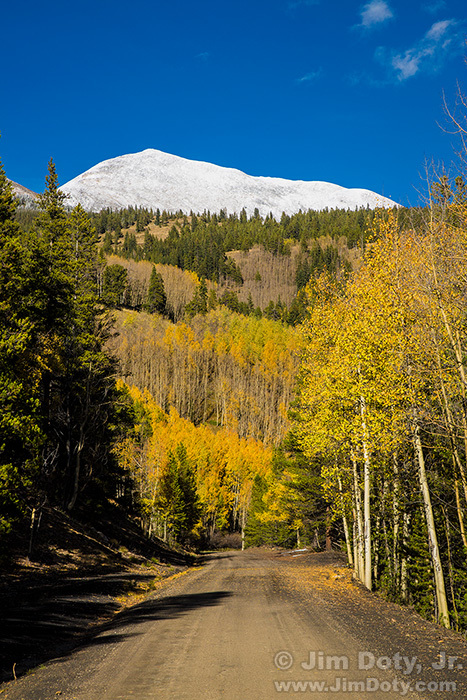 The information you will need for Kebler Pass is covered in the West Elk Loop Scenic Byway in Stewart Green’s Scenic Driving Colorado (link below). With a bit of back tracking, Kebler Pass and Ohio Pass make a good two pass combination that are well worth one or two days of your time. Ohio Pass is another great drive that runs from near the Kebler Pass summit on the north end to Gunnison on the south end. Different stretches peak from the end of September through the first week of October). Looking for more locations? Check out my recommendations below for my favorite location guides to Colorado. The article above and the books below tell you where to go, but, except for a few tips, it does not tell you how to take great pictures when you get there. Check out the “how-to” books that I recommend below, along with dozens of article on my web sites. A big thanks in advance for choosing to order books from Amazon.com via my photography store at the links below. You get the same great Amazon prices, service, and guarantee, and you help support my web sites making articles like this one possible. Article history. Originally posted July 24, 2015. Updated and re-posted September 22, 2015. Updated and re-posted August 16, 2016, and again September 14, 2016. Expanded September 16, 2016. Updated and re-posted July 16, 2017 and again September 13, 2017. Updated and re-posted March 9, 2018. Updated April 7, 2018. Updated and re-posted July 22, 2018. Photography by moonlight. Workshop field trip at Bear Lake. Rocky Mountain National Park. September 26, 2015. If you are ready to take your nature photography to the next level, sign up for one of my photography workshops in Colorado or Michigan. All my workshops are linked at JimDoty.com. “True Grit Then and Now” at Colorado Vibes. Maps of the movie locations. Video: True Grit Locations by Colorado Vibes (Jeepster Gal). Clips from the movie followed by current photos of the same locations. This travels guide tells you where to go, but not how to create stunning images when you get there. Reading the qualities of light is a key to great images. Mastering exposure is essential to the best color your camera is capable of producing (and a little known professional secret). Knowing how to make your digital camera do its special tricks for you is important to eye-popping images. Professional secrets for creating outstanding landscape, wildlife, wildflower, and night time photography will take your photography to the next level. You can learn all this and more in Digital Photography Exposure for Dummies, one of the highest rated photography books at Amazon.com. It is your guide to mastering the ins and outs of your digital camera. You can order it here from Amazon’s third party sellers and be covered by Amazon’s A to Z guarantee. You can also order autographed copies directly from me. Just send me an email for details. After reading my photography book, what should you read next? Here are some links to articles about my favorite nature photography books. Nature Photography Books: The Three Essentials. If you only read three nature photography books, put these on your “must read” list. My Favorite Introduction to Landscape Photography. If you only read one book on landscape photography, this should be it. This is my favorite to recommend to new landscape photographers. Out of dozens of books I have on Colorado, there are four that I consider “must have” scenic guides. They will keep you busy for years of wandering, enjoying and taking pictures in this beautiful state. All four are listed below with links to buy them at Amazon.com via my photography store. Of the four “must have” guide books to scenic locations in Colorado, if you only get one, this is the one to get. The Colorado portion of the book covers over 150 locations which are ranked on a scale from 1 to 5 for “Scenic Value” and “Photographic Interest”. Each location is also rated for road difficulty (from paved to high clearance four wheel drive) and trail difficulty (if you have to hike to the location). Photographs are in full color. All location guide books for photographers should be written like this. Laurent has also written guide books in the series for Southern Utah (Volume 1) and Arizona (Volume 2). On my first trip to Southern Utah I found Laurent’s book to be invaluable. If you are going to Colorado, I highly recommend these books by Lee Gregory. Each volume takes you to 50 scenic locations, 100 in all if you get both the Southern Colorado and Northern Colorado books. They cover less locations than the book by Laurent Martres but in much more detail. In addition to describing each location in detail, he has a summary chart that lists all the sites, the kind of scenery, the kind of access (i.e., paved road, dirt road, 4WD, difficult 4WD and/or hike), the best time of day and best seasons of the year, and he rates the scenic quality in 4 categories: Scenic, Very Scenic, Extremely Scenic, and Superbly Scenic. This is a terrific two book set. This book places the emphasis on scenic drives as opposed to scenic locations. It covers all of the officially designated national and state scenic byways that are located in Colorado.There are detailed descriptions, maps, and photographs that will serve you well as you wander “Colorful Colorado”.